This Aguila manufactured grey, blue, & black cardboard box contains all 50 rounds of 60 grain El.. 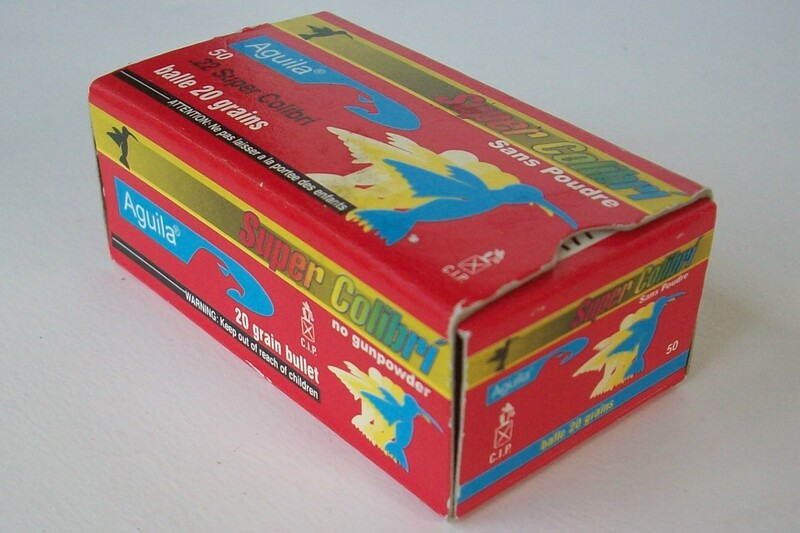 This Aguila manufactured red, blue, & yellow cardboard box contains all 50 rounds of 20 grain Su.. 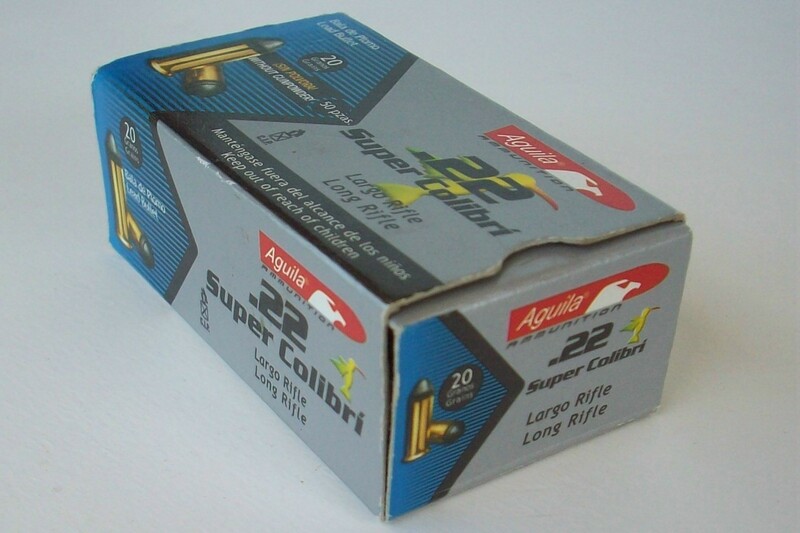 This Aguila manufactured grey, blue, & black cardboard box contains all 50 rounds of 20 grain Su.. This CCI manufactured black, red and gray cardboard box contains all 50 rounds of 200 grain TMJ alum.. This CCI Blazer manufactured black, gray, red and whitecardboard box contains all 50 rounds of .. 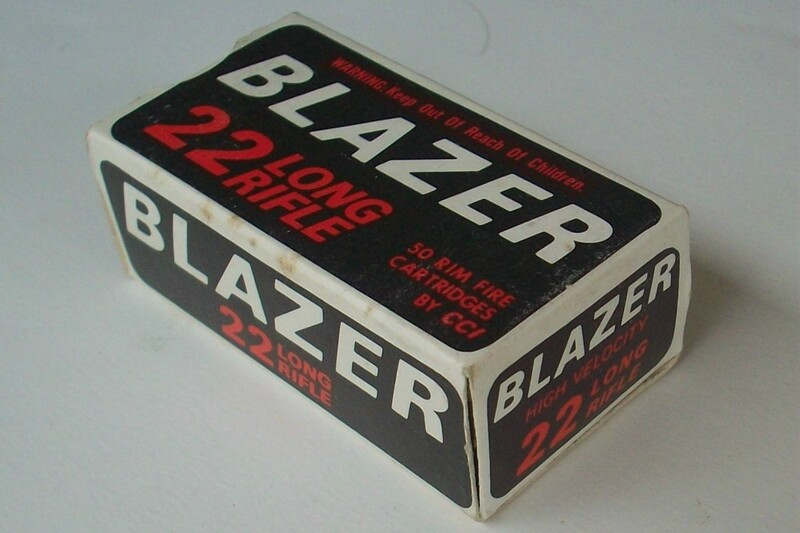 This CCI manufactured black, red, and white cardboard box contains all 50 rounds of Blazer high velo.. 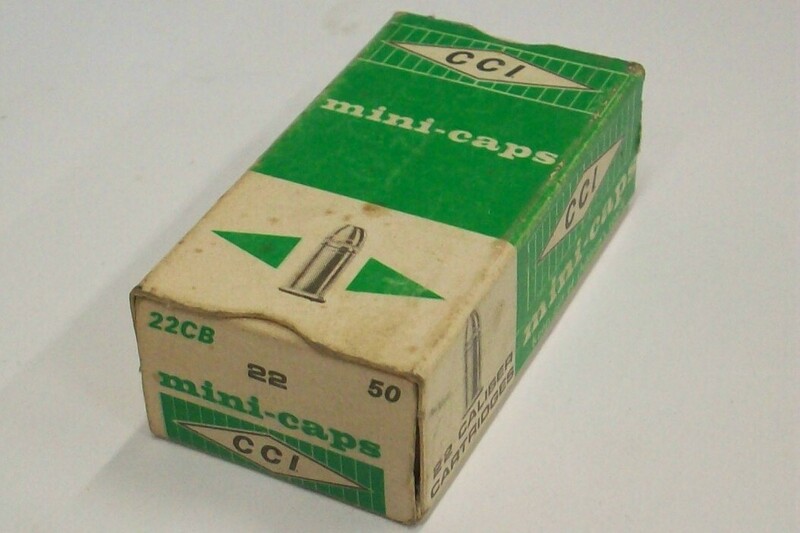 This CCI manufactured green and white cardboard box contains all 50 rounds of Mini Caps 22 Short amm.. 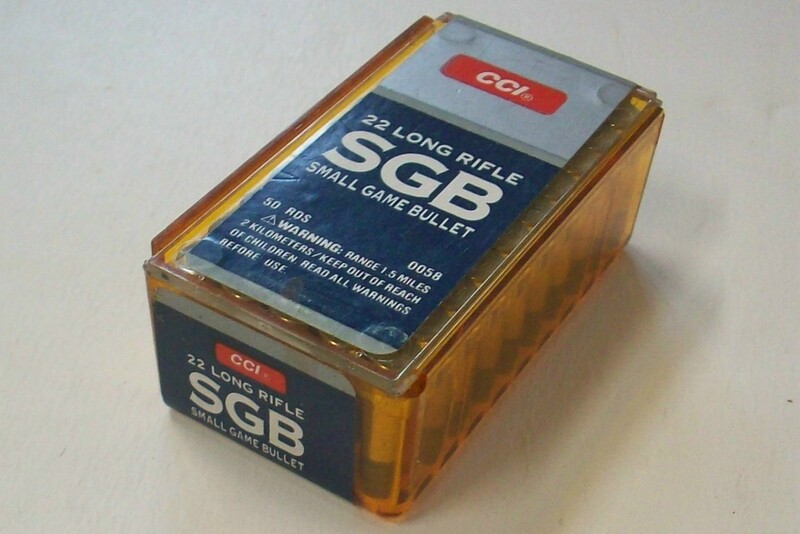 This CCI manufactured plastic sleeve contains all 100 rounds of CB 22 Short Mini Caps ammunition and.. 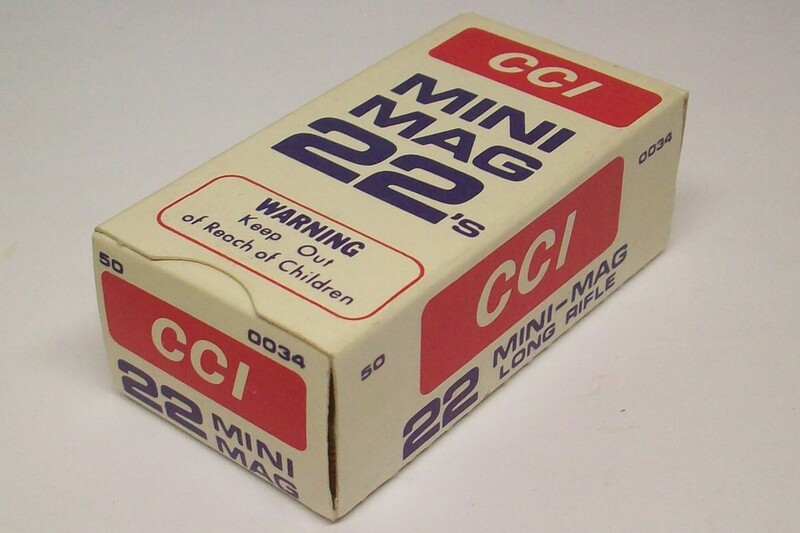 This CCI manufactured red and white cardboard box contains all 50 rounds of Mini Mag 22 LR ammunitio.. 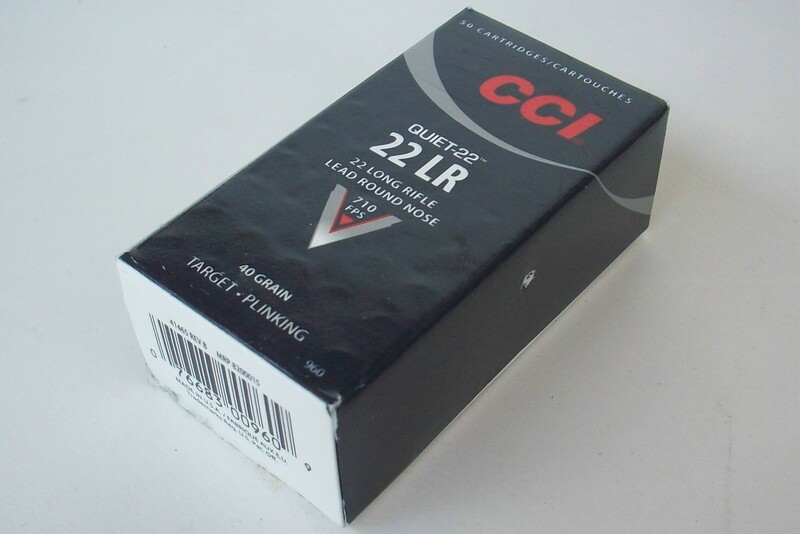 This CCI manufactured white, red, and blue cardboard box contains all 50 rounds of Mini Mag 22 LR am.. 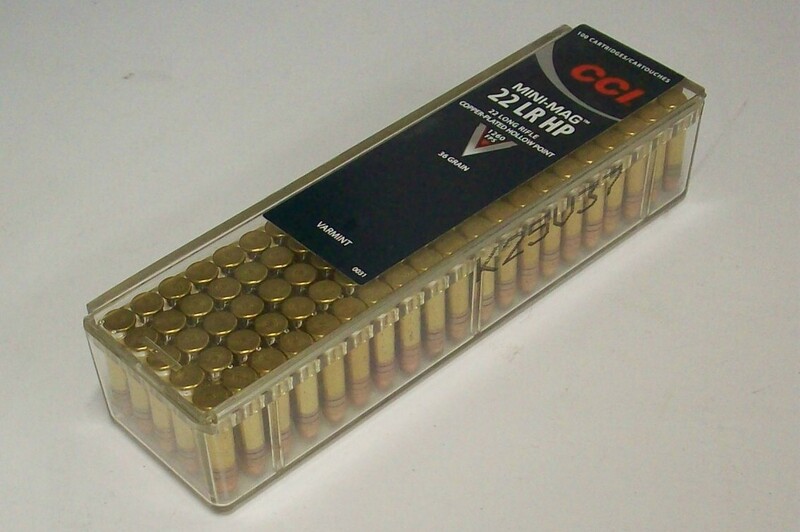 This CCI manufactured factory sealed plastic sleeve contains all 100 rounds of 36 grain Varmint Mini.. This CCI manufactured blue, red, and silver cardboard box contains all 50 rounds of 40 grain lead ro.. 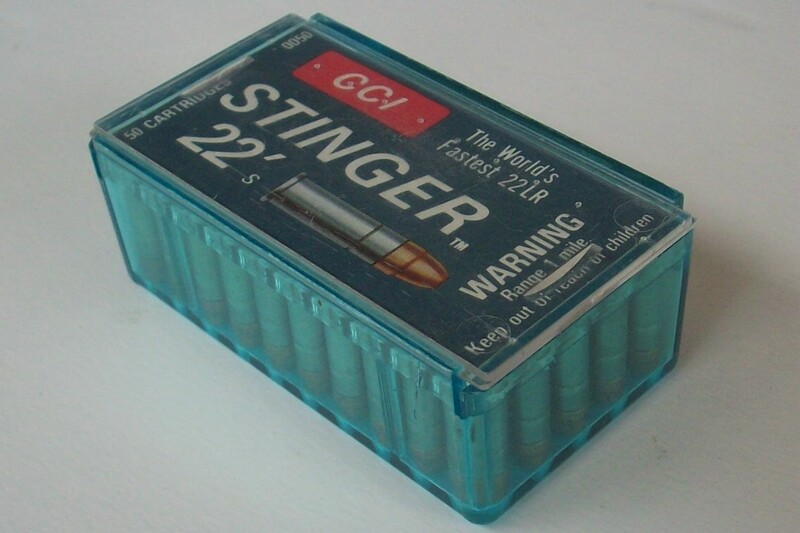 This CCI manufactured factory sealed plastic box contains all 50 rounds of 22 LR Small Game Bullet a.. 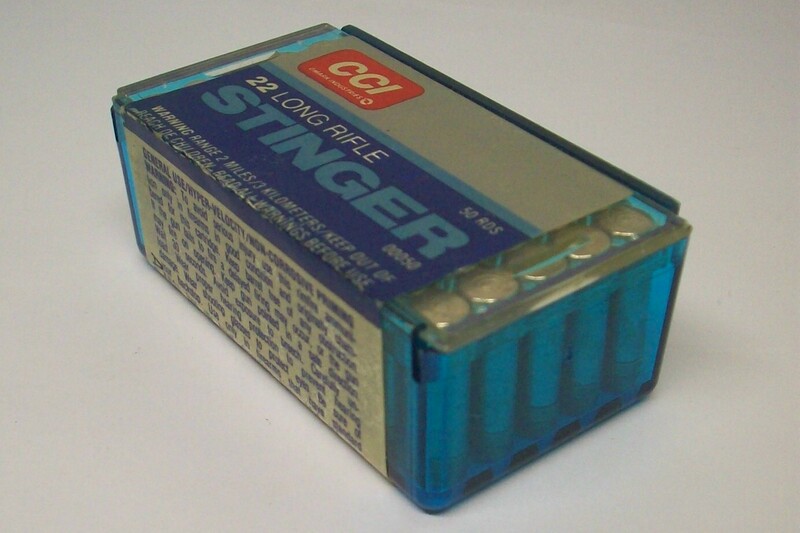 This CCI manufactured plastic box contains all 50 rounds of 22 LR Stinger hollow point ammunition an.. 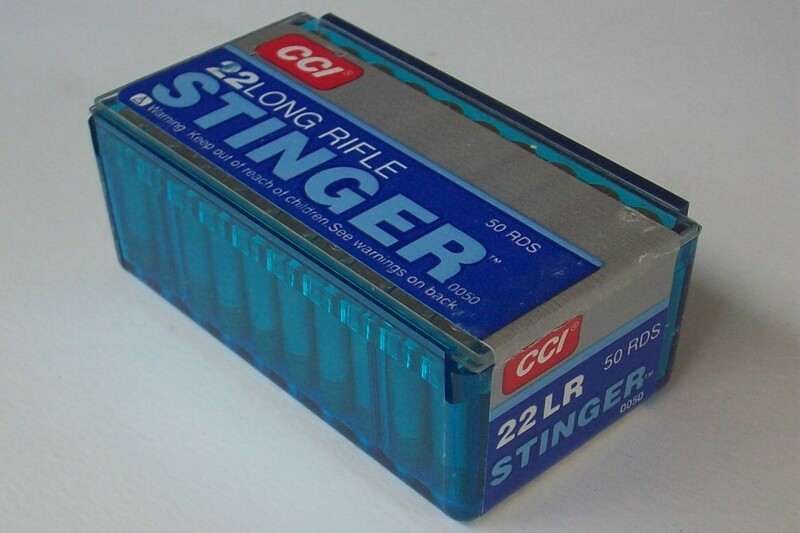 This CCI manufactured factory sealed plastic box contains all 50 rounds of 22 LR Stinger hollow poin.. 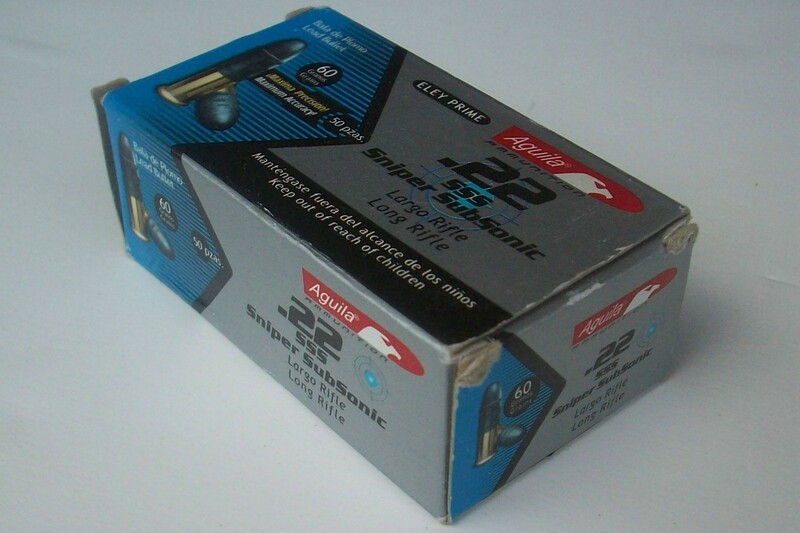 This clear synthetic package by CCI with a blue label contains all 100 rounds of sub-sonic CB 22 Lon.. 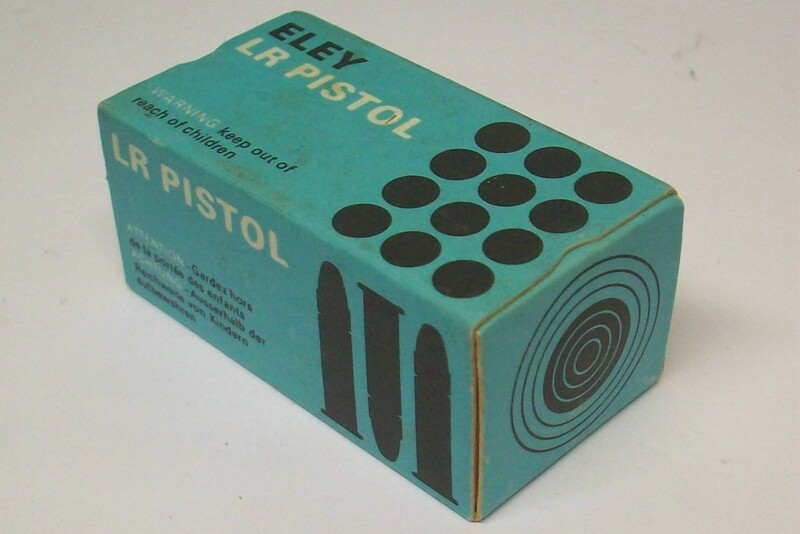 This Eley manufactured blue, black, and white cardboard box contains all 50 rounds of LR Pistol 22 L.. 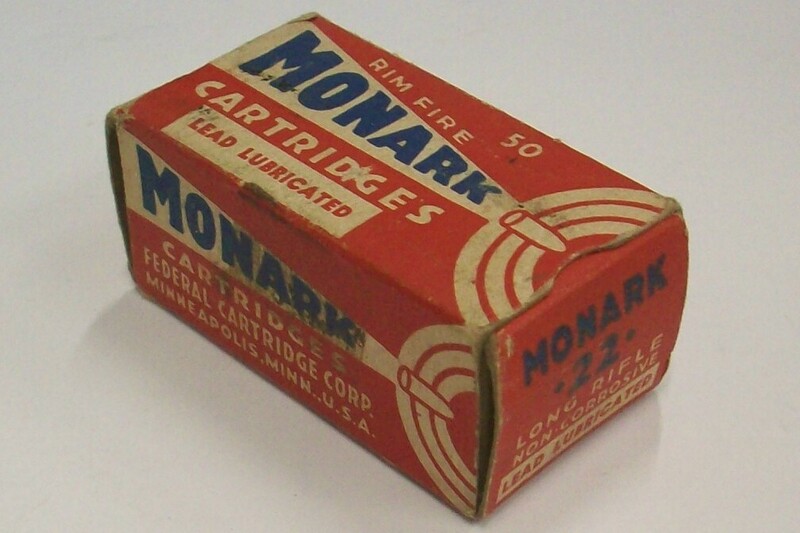 This Federal Cartridge Company manufactured red, dark blue, white, and yellow cardboard box contains.. 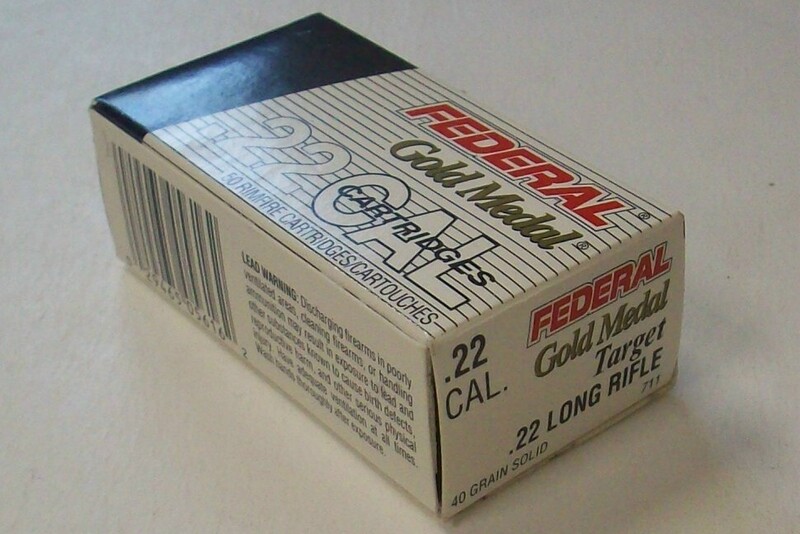 This Federal Cartridge Company manufactured red and white cardboard box contains all 50 rounds of Am.. 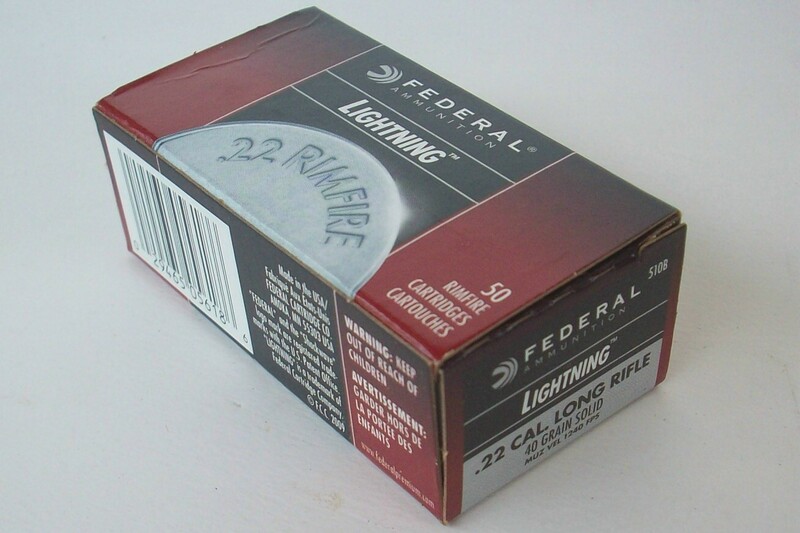 This Federal Cartridge Co gray, blue, red and white cardboard box contains all 50 rounds of 225 grai.. 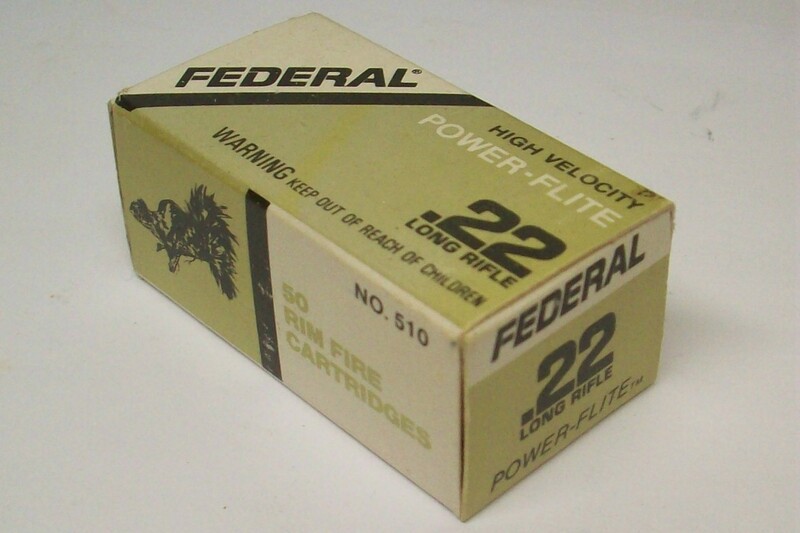 This Federal Cartridge Company manufactured blue, black and gray cardboard box contains all 50 round.. 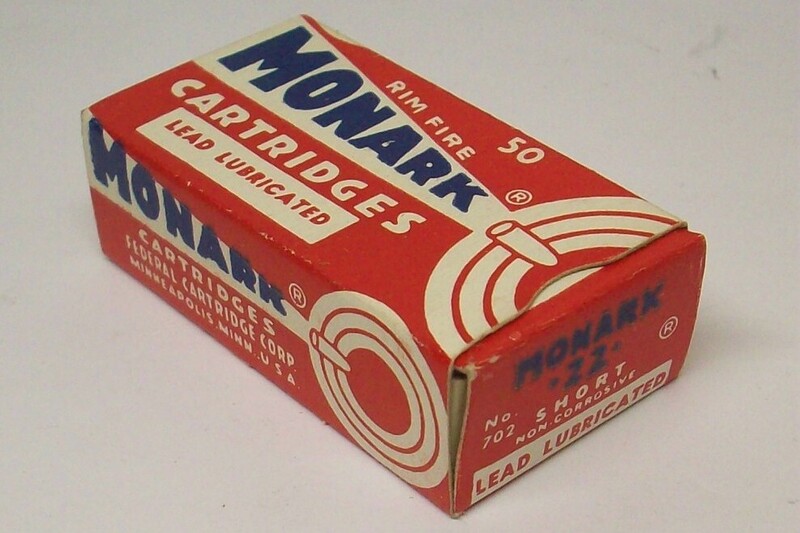 This Federal Cartridge Company manufactured white, red and black cardboard box contains all 50 round.. 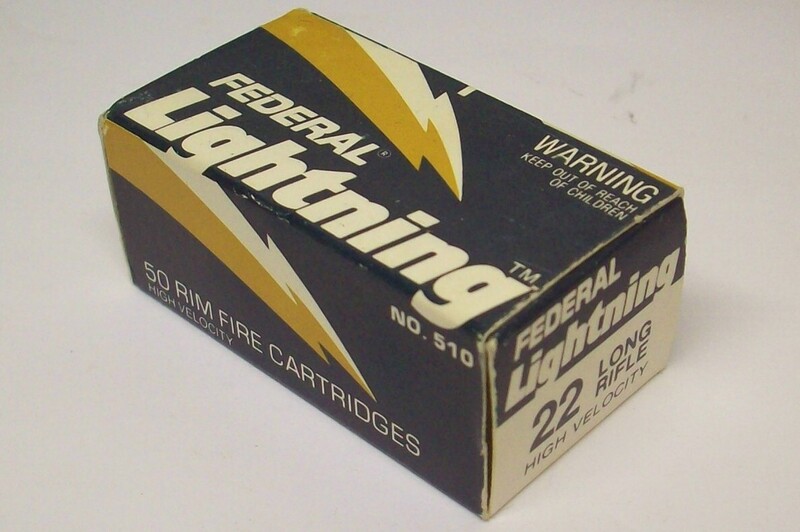 This Federal Cartridge Company manufactured white, blue, red and gold cardboard box contains all 50 .. 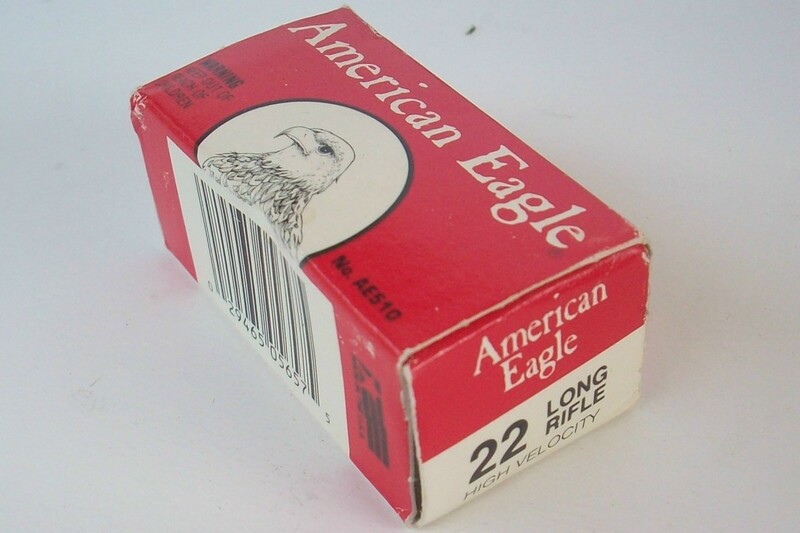 This Federal Cartridge Company manufactured blue, red and white cardboard box contains all 50 rounds.. 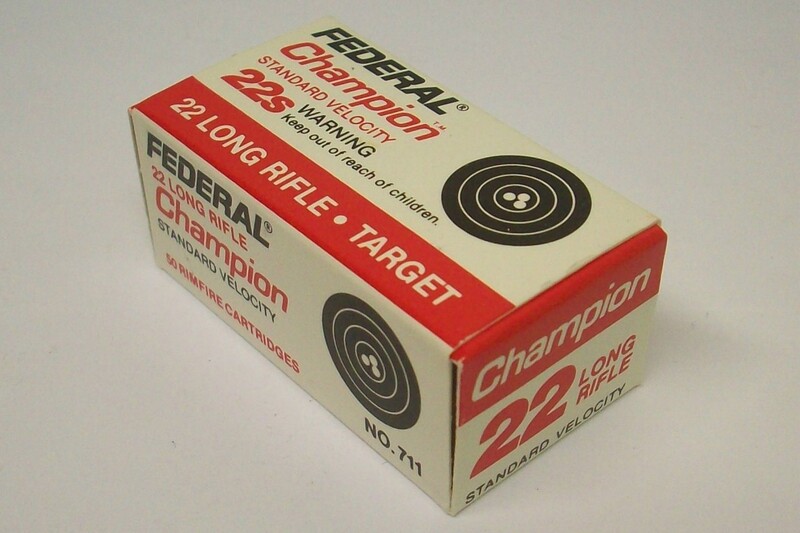 This Federal Cartridge Company manufactured red and white cardboard box contains all 50 rounds of Hi.. 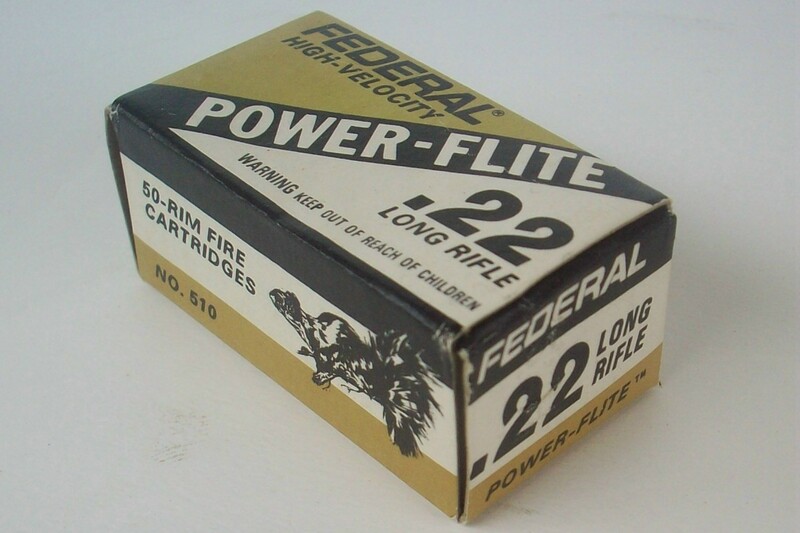 This Federal Cartridge Company manufactured plastic sleeve contains all 100 rounds of Hi-Power Hollo.. 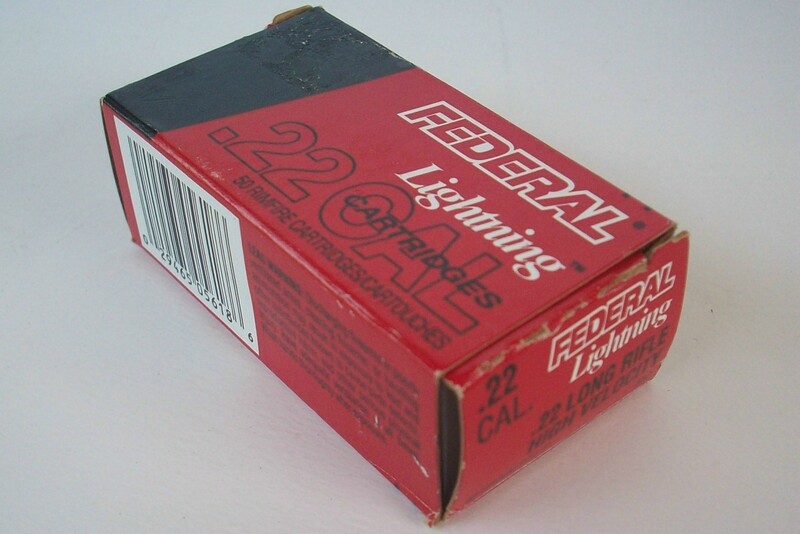 This Federal Cartridge Company manufactured red, dark blue, and white cardboard box contains all 50 .. This Federal Cartridge Company manufactured burgundy and black cardboard box contains all 50 rounds .. This Federal Cartridge Company manufactured blue, gold, and white cardboard box contains all 50 roun.. 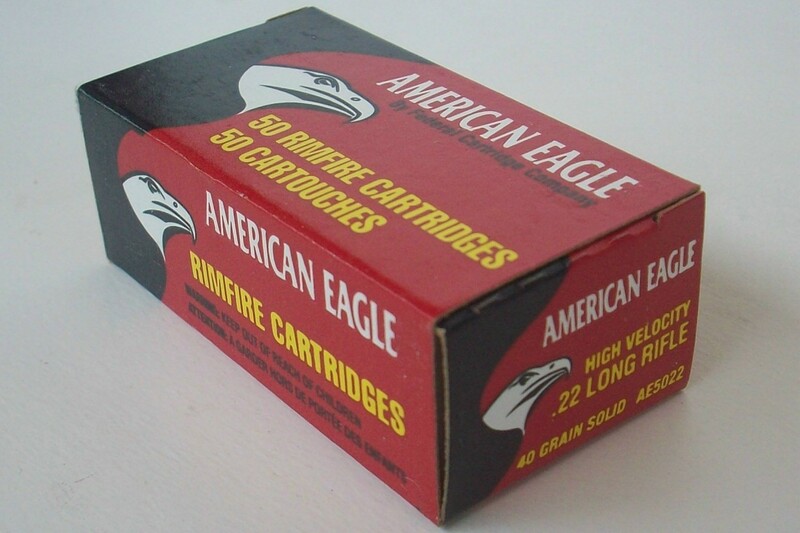 This Federal Cartridge Company manufactured red, white, and blue cardboard box contains all 50 round.. 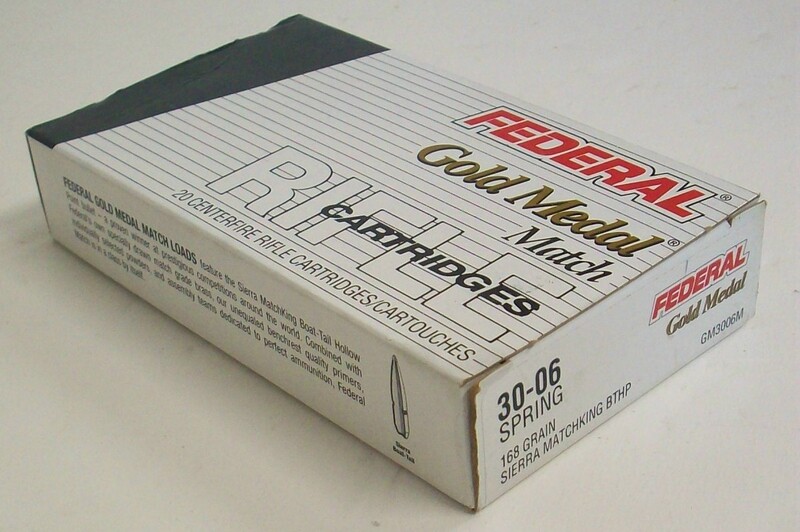 This Federal Cartridge Company manufactured gold, black, and white cardboard box contains all 50 rou.. 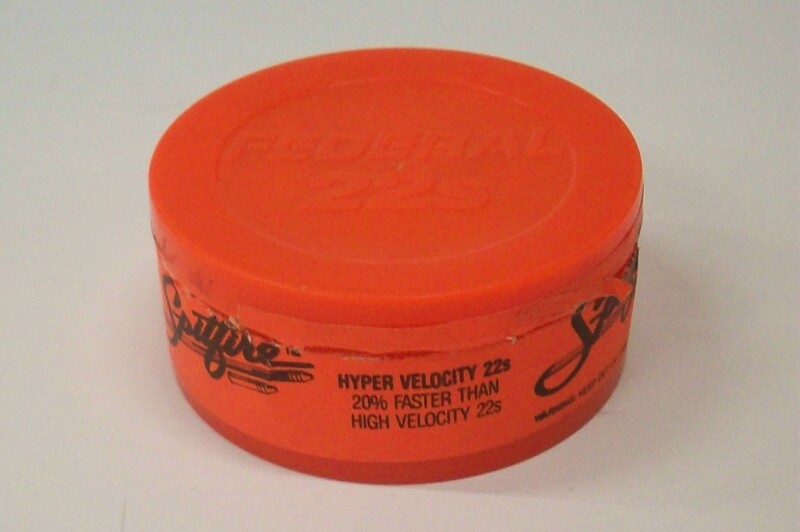 This Federal Cartridge Company manufactured florescent orange round plastic container contains all 5.. 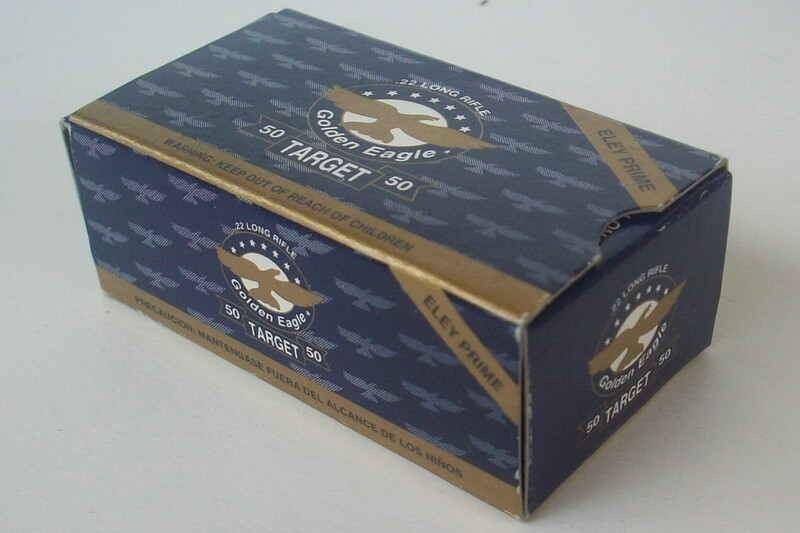 This Golden Eagle manufactured blue and gold cardboard box contains all 50 rounds of Eley Prime Targ.. 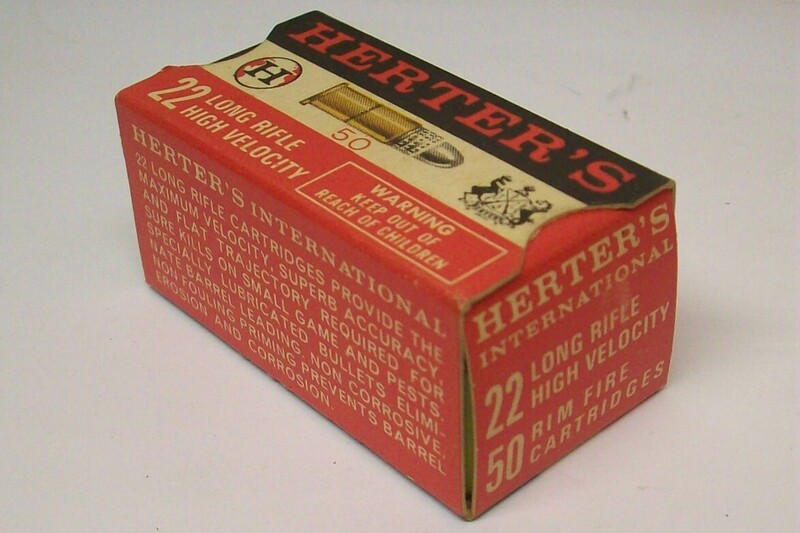 This Herter's manufactured red, white, and black cardboard box contains all 50 rounds of high veloci.. This Lapua manufactured blue, yellow, & red cardboard box contains all 50 rounds of matchgrade 2.. 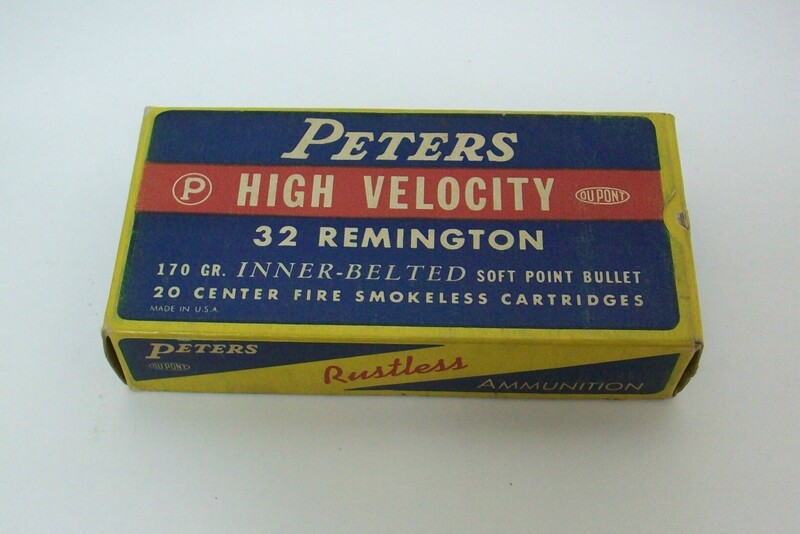 This Peters Rustless Filkote black, gray and white box contains 27 of the original 100 rounds of 22 .. 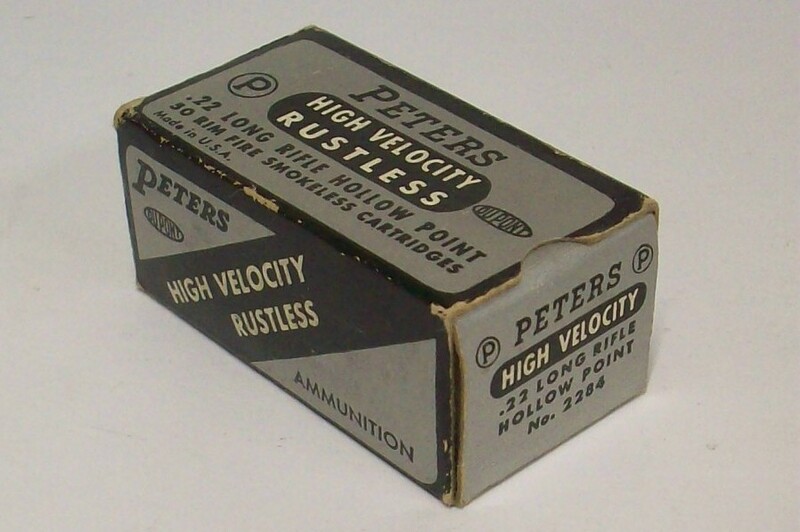 This Peters manufactured black and silver cardboard box contains all 50 rounds of High Velocity Rust.. 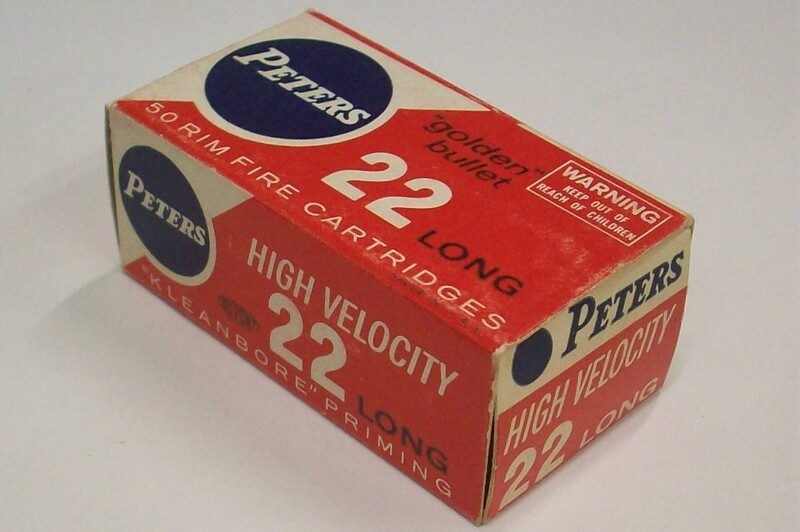 This Peters manufactured red, white, and blue cardboard box contains all 50 rounds of Golden Bullet .. 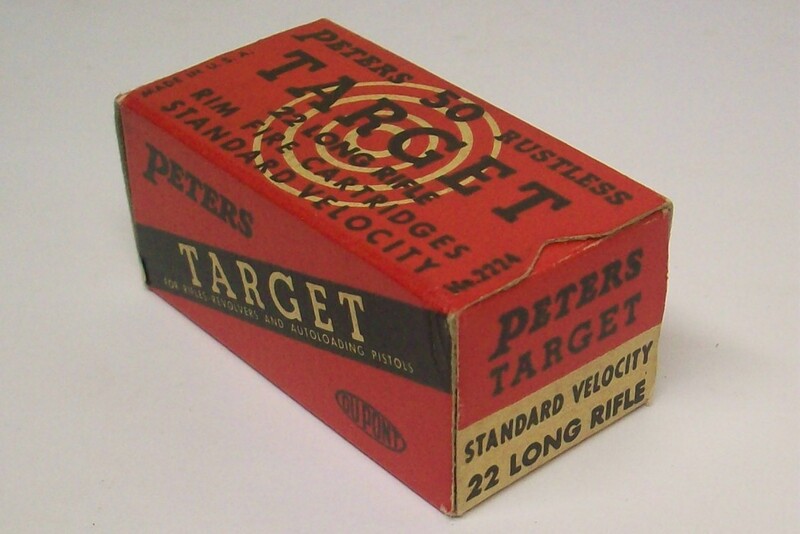 This Peters Cartridge Division manufactured red, black and white cardboard box with bullseye design .. 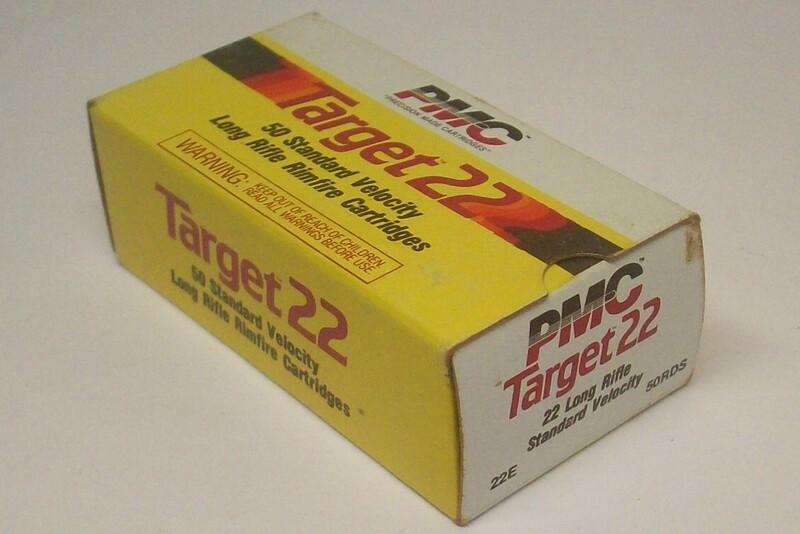 This PMC manufactured yellow, red, and white cardboard box contains all 50 rounds of Target standard.. This PMC manufactured orange, red, and white cardboard box contains all 50 rounds of Zapper high vel.. 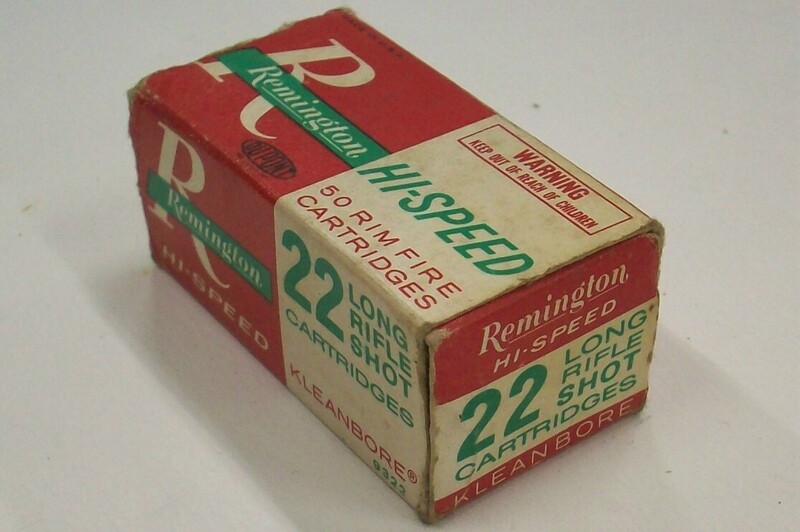 This Remington manufactured green, red and white cardboard box contains 100 loose rounds of 22 rimfi.. 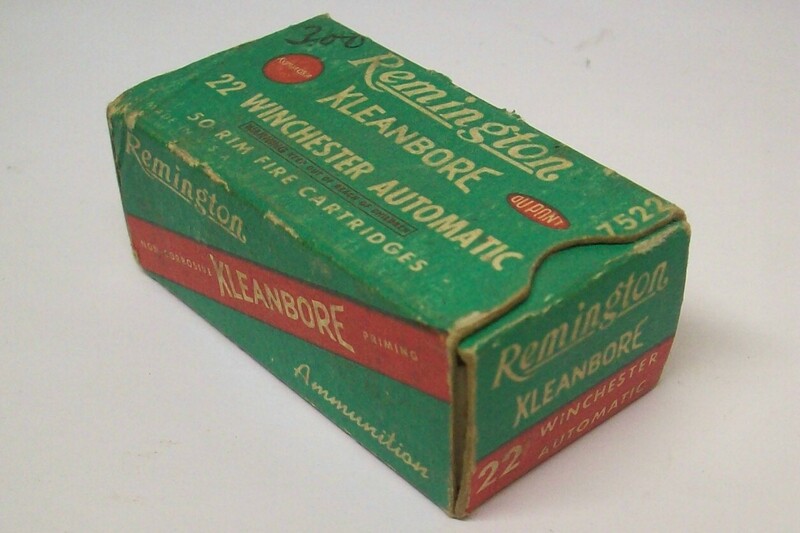 This Remington manufactured green, red, and white cardboard box with the bowtie shaped "Kleanbore" d.. 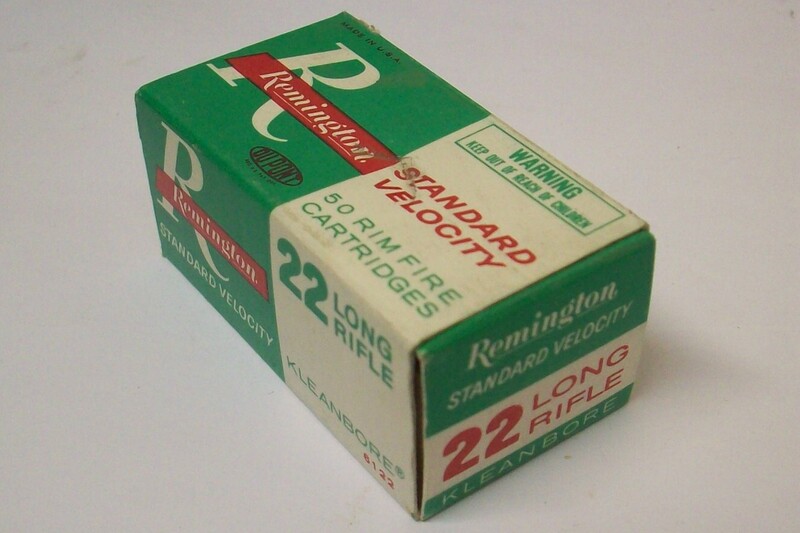 This Remington manufactured green, white, and red cardboard box contains all 50 standard velocity 22.. 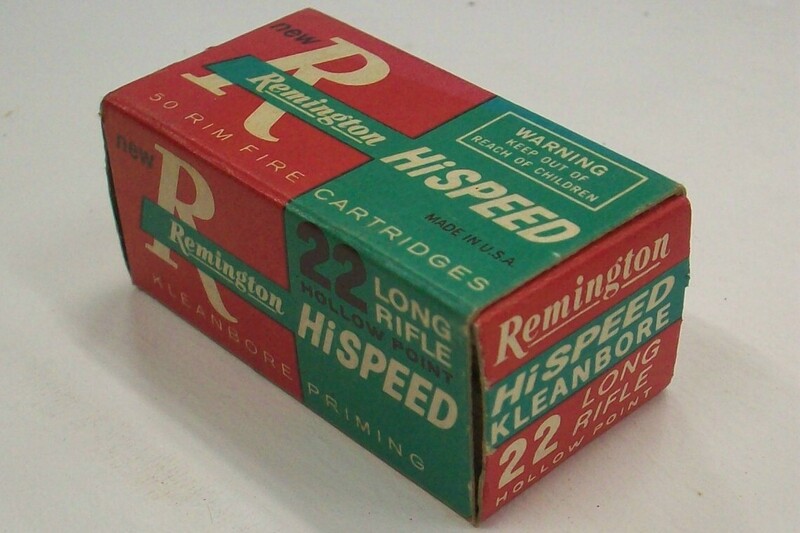 This Remington manufactured red, blue, and white cardboard box with the shield like design and red b.. 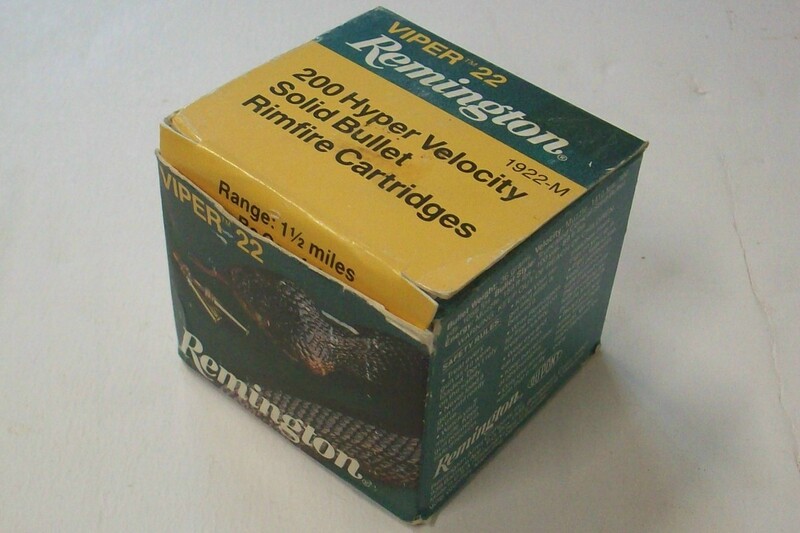 This plain white Remington cardboard box with back printing contains all 50 rounds of 230 grain meta.. 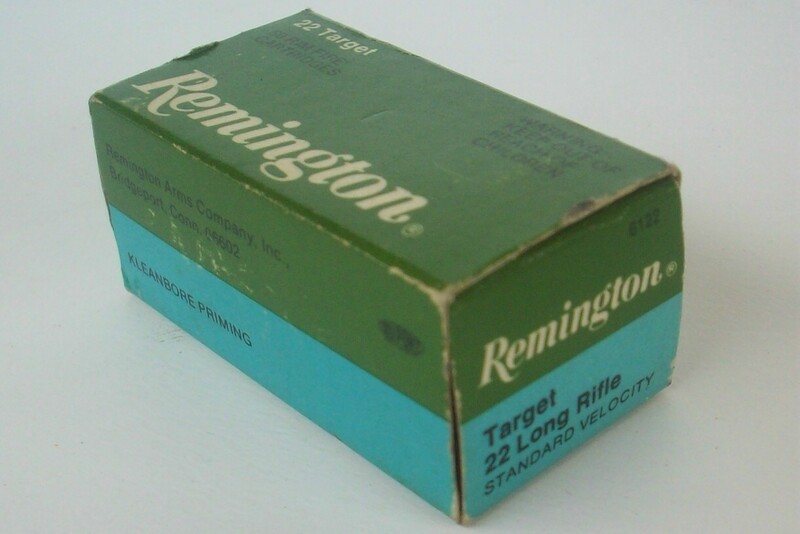 This Remington manufactured factory sealed green plastic bulk pack box contains all 250 rounds of Hi.. 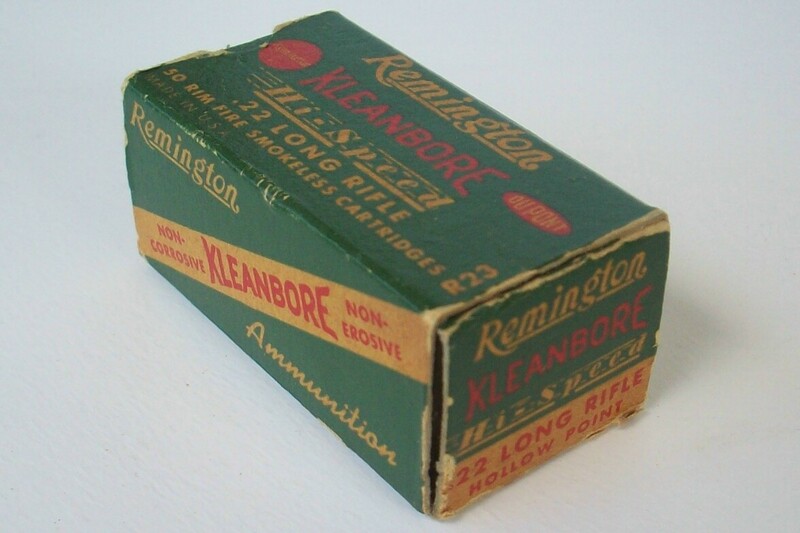 This Remington manufactured green, tan, & white cardboard box contains all 50 rounds of 30 grain.. 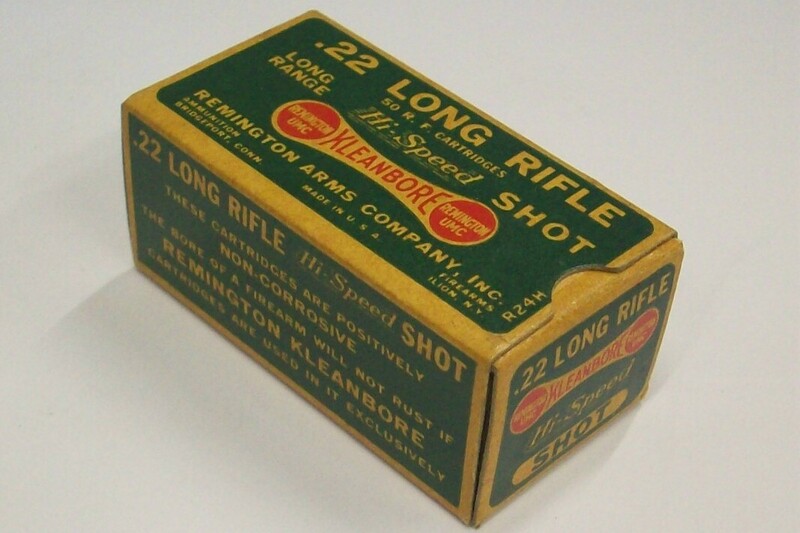 This Remington green and yellow Express Long Range box contains all 25 rounds of 3" long No. 7 1/2 s.. 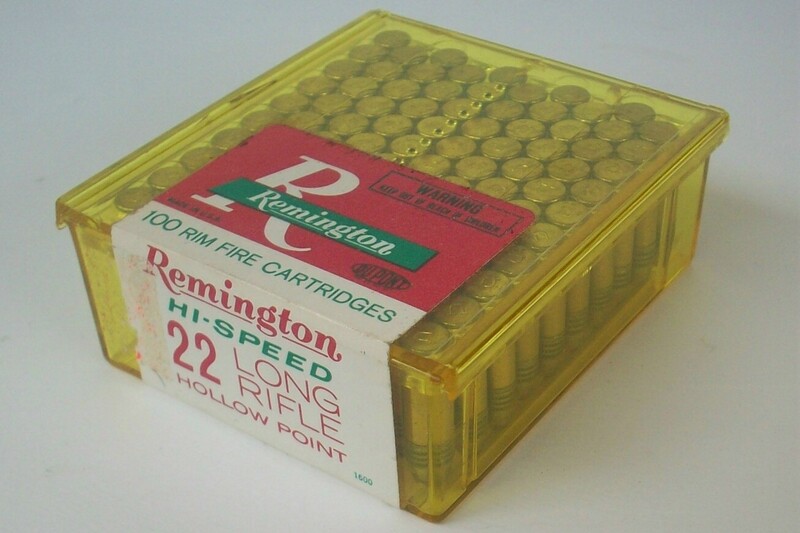 This Remington manufactured factory sealed plastic box contains all 100 rounds of Hi-Speed Hollow Po.. 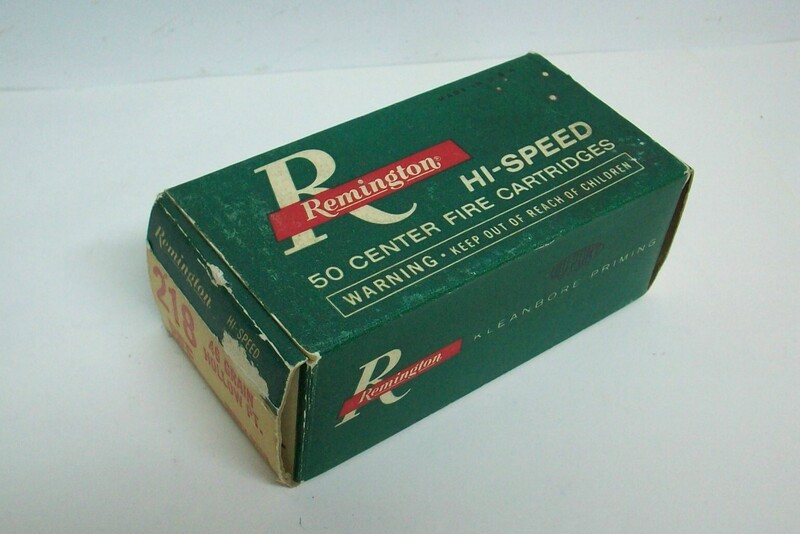 This Remington manufactured red, green, and white cardboard box contains all 50 rounds of Hi-Speed K.. 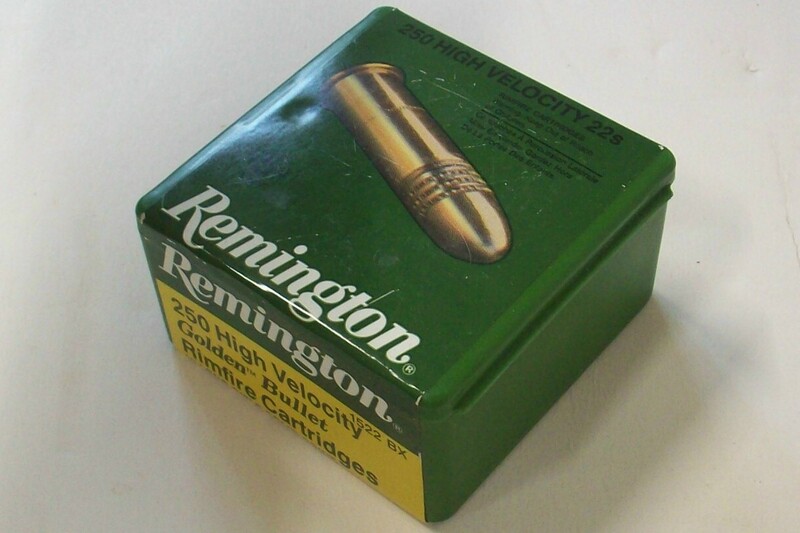 This Remington manufactured plastic box contains all 100 rounds of 40 grain Solid Point High Velocit.. 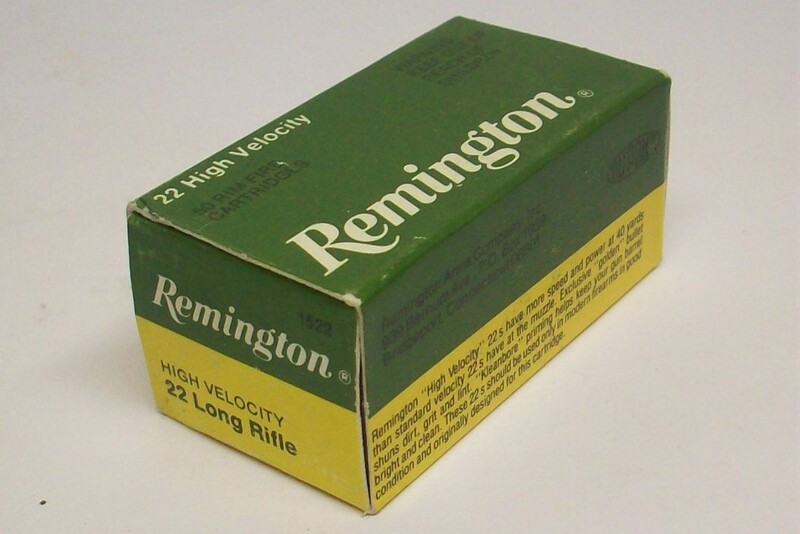 This Remington manufactured green and yellow cardboard box contains all 50 rounds of High Velocity 4.. 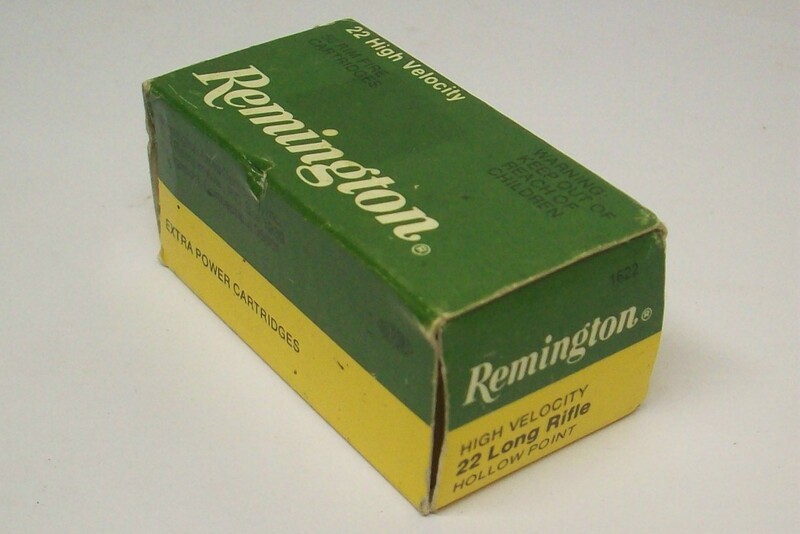 This Remington manufactured green and yellow cardboard box contains all 50 rounds of High Velocity e.. 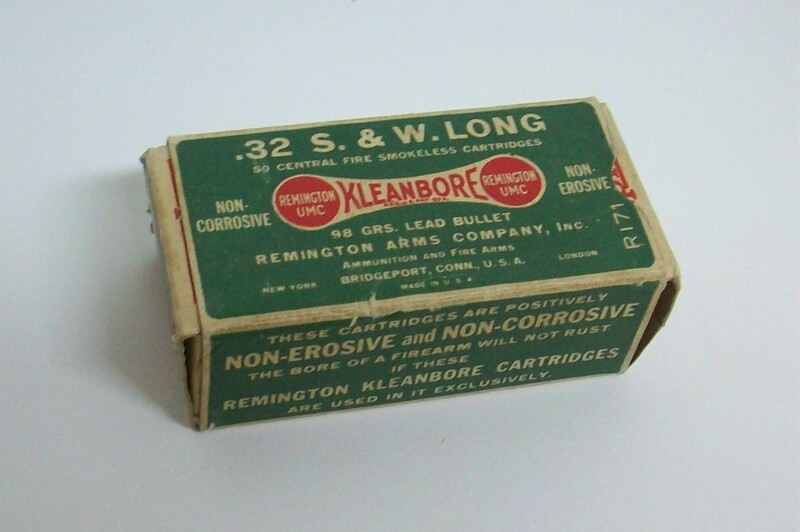 This Remington manufactured green, red and white cardboard box contains all 50 rounds of Kleanbore 2.. 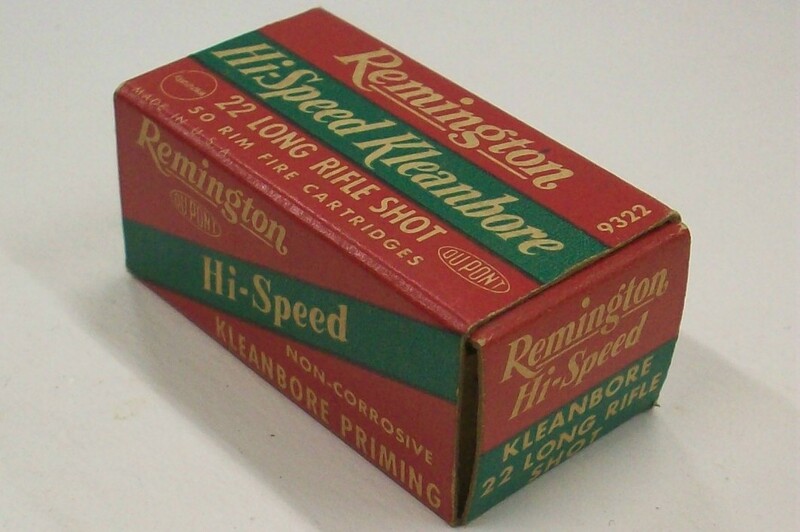 This Remington manufactured green, white, and red cardboard box contains all 50 rounds of Kleanbore .. 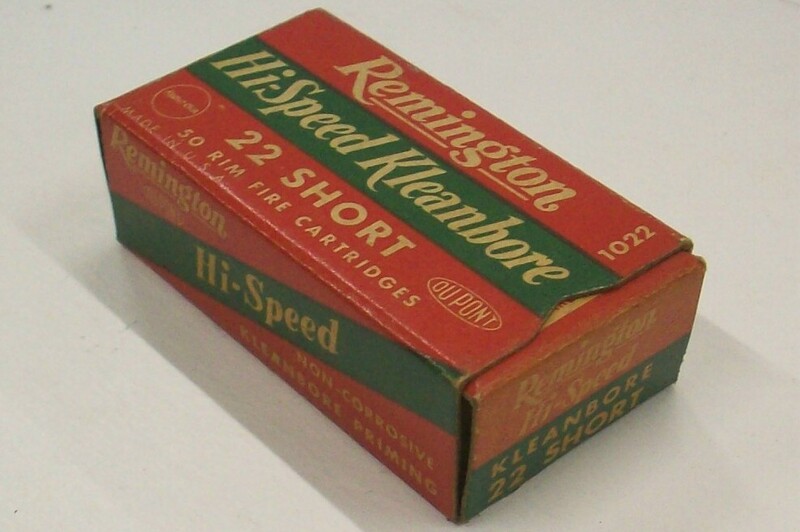 This Remington manufactured green, red & white cardboard box with the dog bone design contains a.. 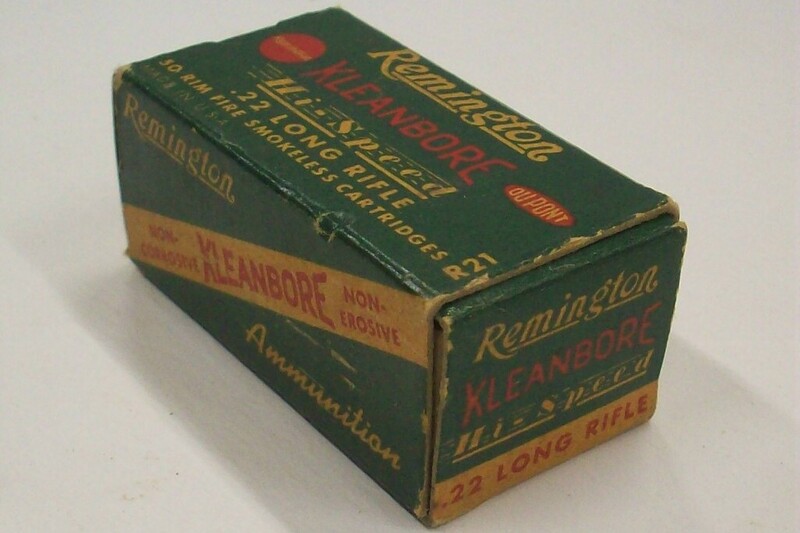 This Remington manufactured green, red & white cardboard box contains all 50 rounds of Kleanbore.. 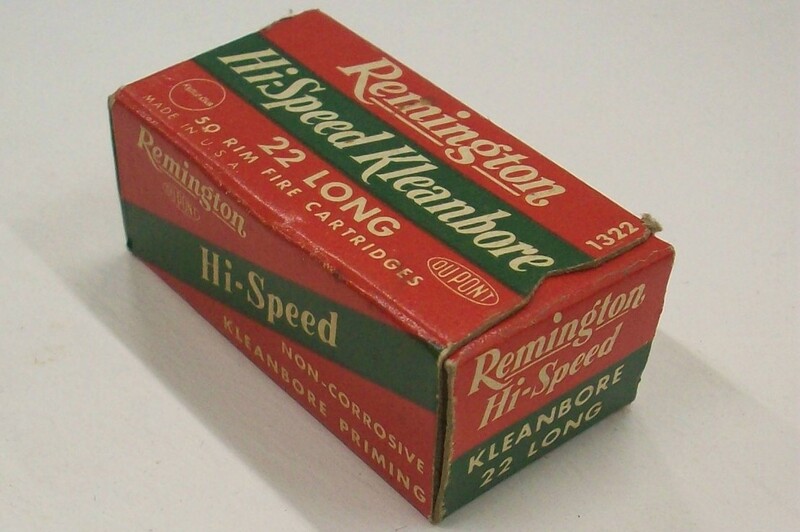 This Remington manufactured red, green, and white cardboard box contains all 50 rounds of Kleanbore .. 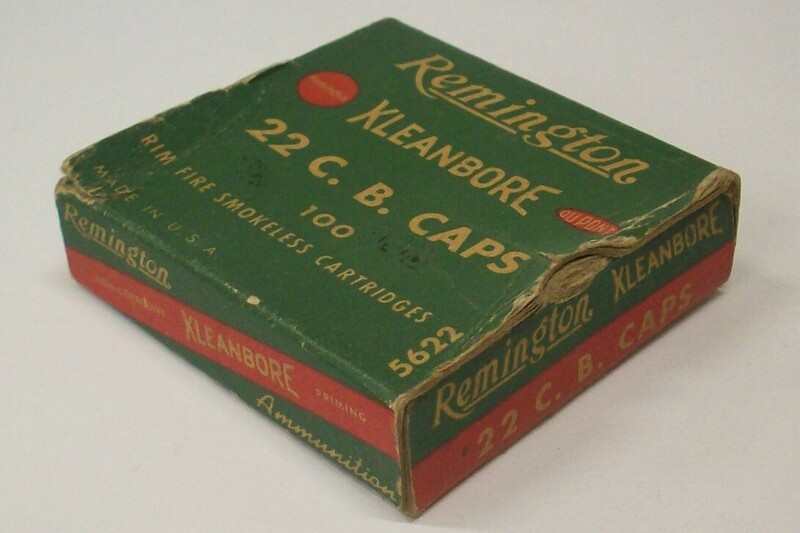 This Remington manufactured red, white, and green cardboard box contains all 50 rounds of Kleanbore .. This Remington manufactured green, red & tan cardboard box with the red ball design contains all.. 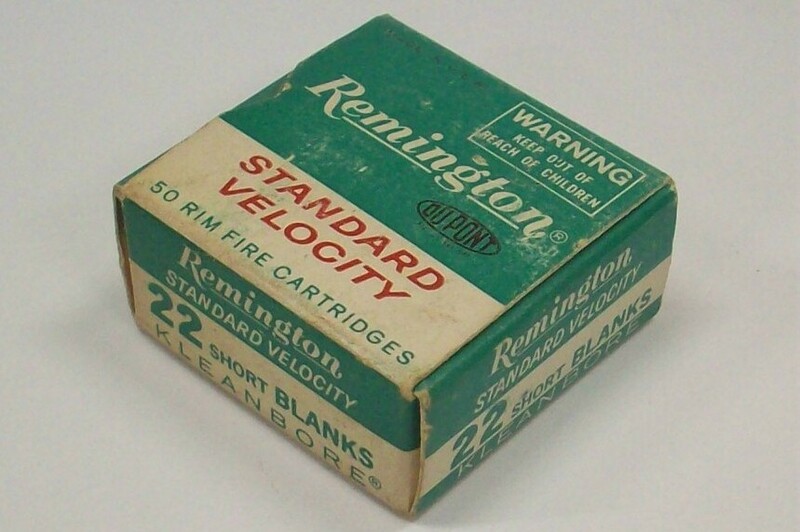 This Remington manufactured white, red and blue cardboard box contains all 50 rounds of 1969 Match 2.. 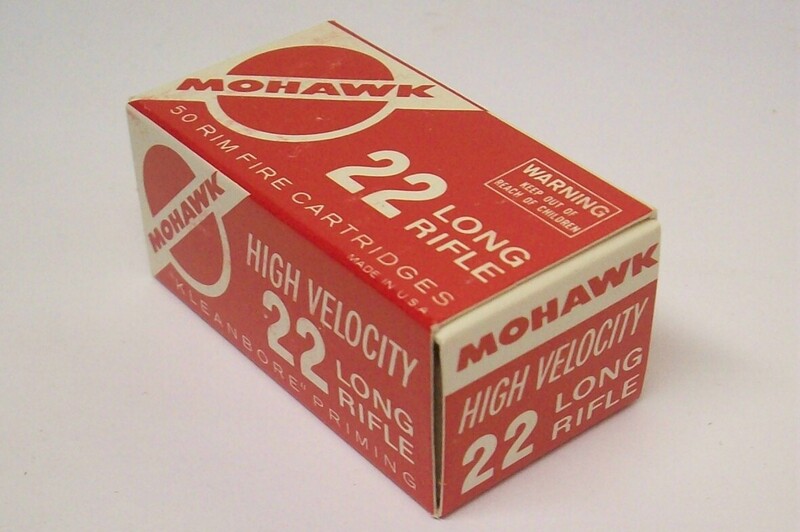 This Remington Mohawk manufactured red and white cardboard box contains all 50 rounds of High Veloci.. This Remington manufactured green, red and white cardboard box contains all 50 rounds of smokeless P.. 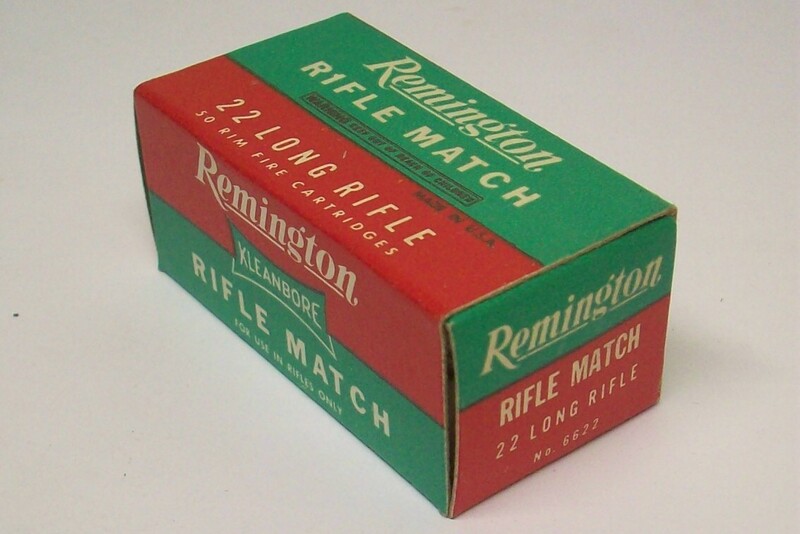 This Remington manufactured green, red and white cardboard box contains all 50 rounds of Rifle Match.. 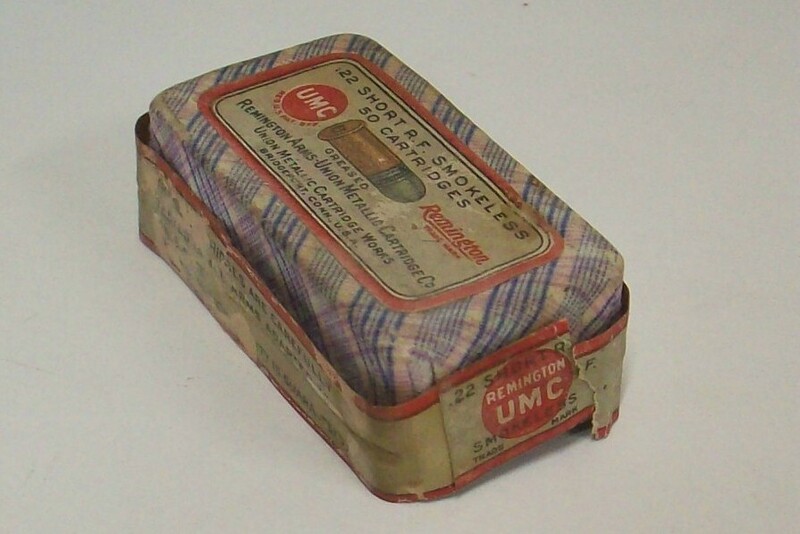 This Remington Arms - Union Metallic Cartridge Co. manufactured pink and blue tartan (plaid) designe.. This Remington manufactured pink and blue tartan (plaid) designed cardboard box contains all 50 roun.. 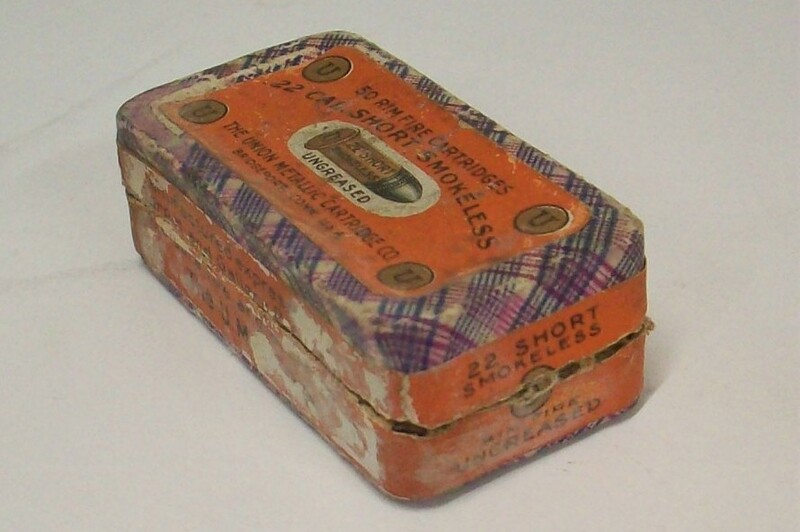 This Remington manufactured purple and blue tartan (plaid) designed cardboard box contains all 50 ro.. This Remington manufactured cardboard box contains all 50 rounds of 38 grain Hollow Point Subsonic l.. 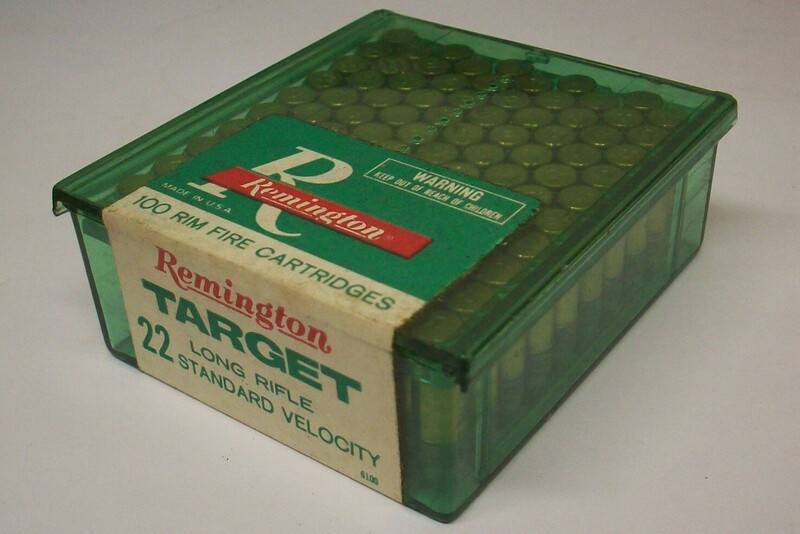 This Remington manufactured factory sealed plastic box contains all 100 rounds of Target standard ve.. This Remington manufactured green and light blue cardboard box contains all 50 rounds of 40 grain so.. 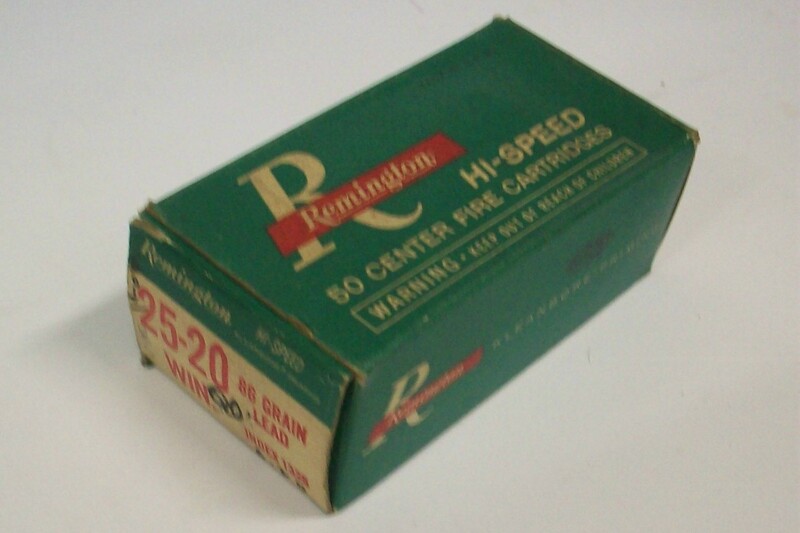 This Remington manufactured cardboard box contains all 50 rounds of 40 grain solid point Thunderbolt.. 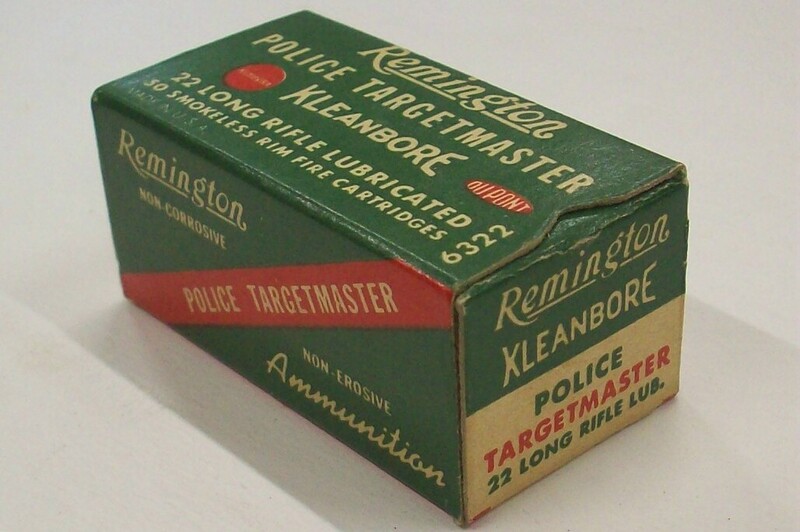 This Remington manufactured cardboard box contains all 50 rounds of 40 grain Lead Round Nose Thunder.. 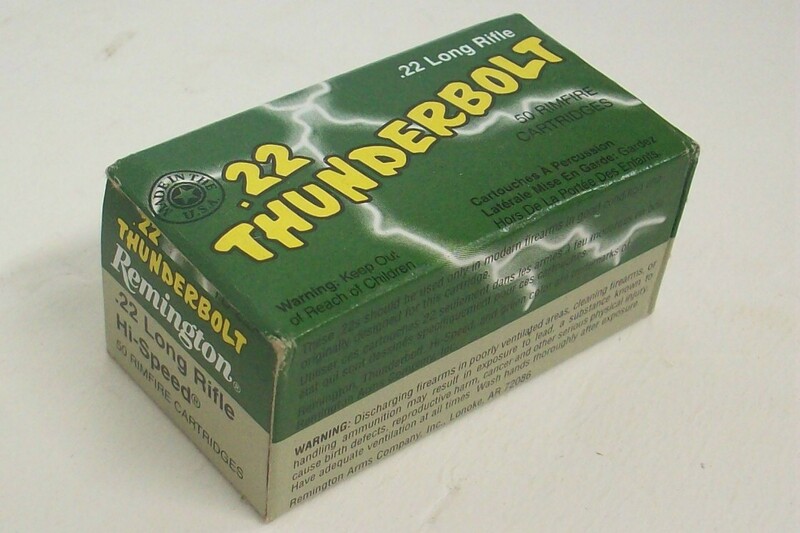 This Remington manufactured cardboard box contains all 50 rounds of Thunderbolt 22 LR ammunition and.. 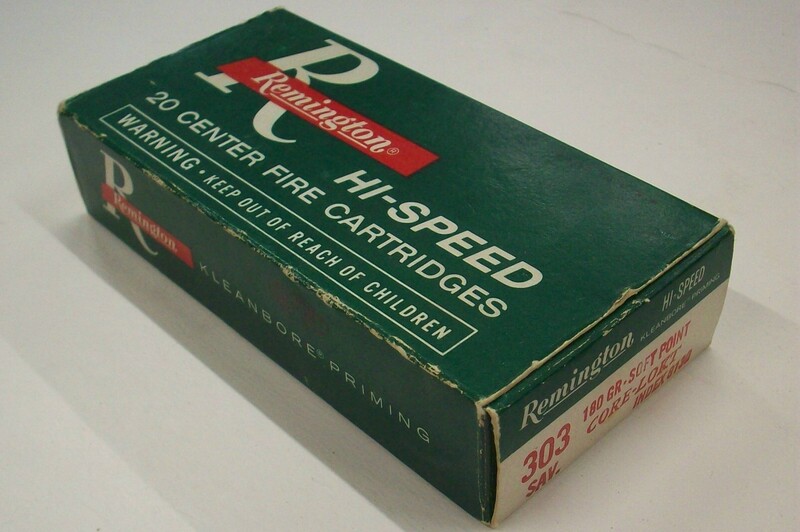 This New Improved Remington manufactured cardboard box contains all 50 rounds of 40 grain solid poin.. 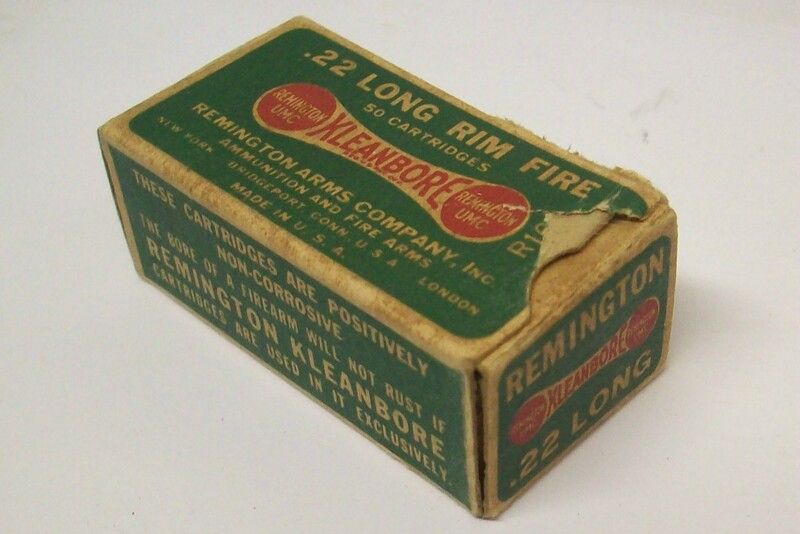 This Remington UMC green and red Kleanbore box with the dog bone design contains 49 of the 50 origin.. 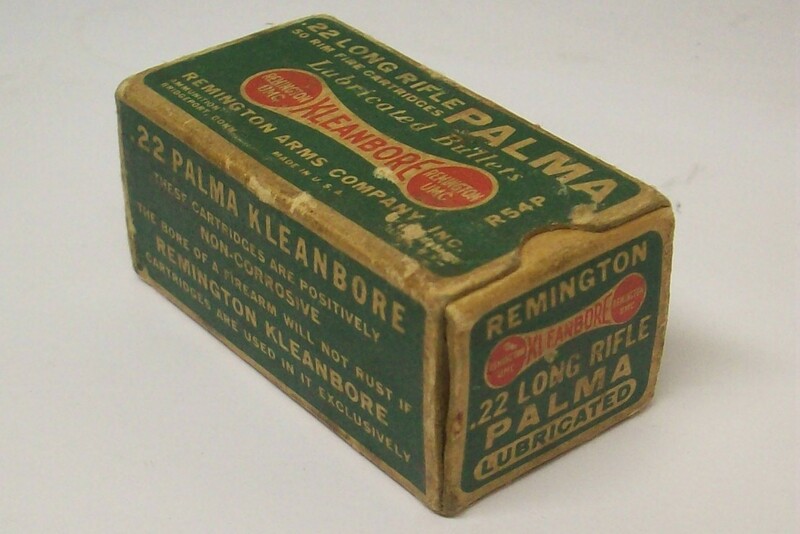 This Remington UMC manufactured green and red dog bone style Kleanbore Palma cardboard box contains .. 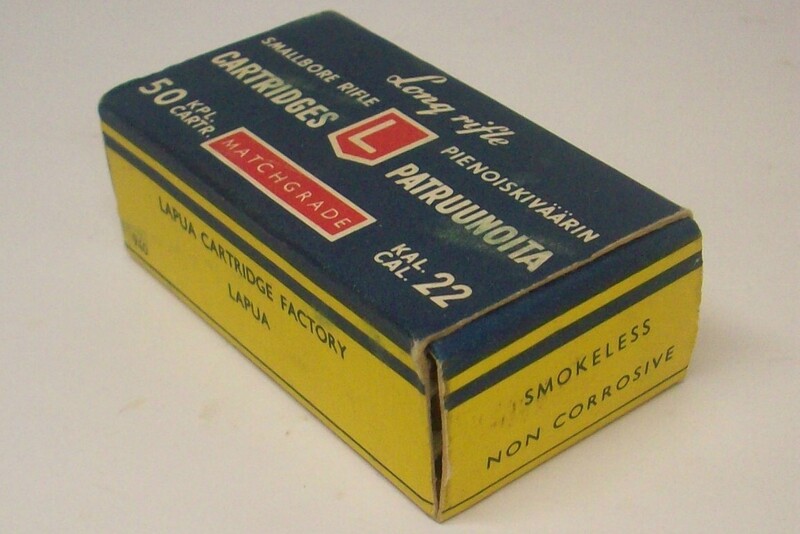 This Remington manufactured green and yellow mini brick (not modified) contains all 4 boxes of 50 ro.. 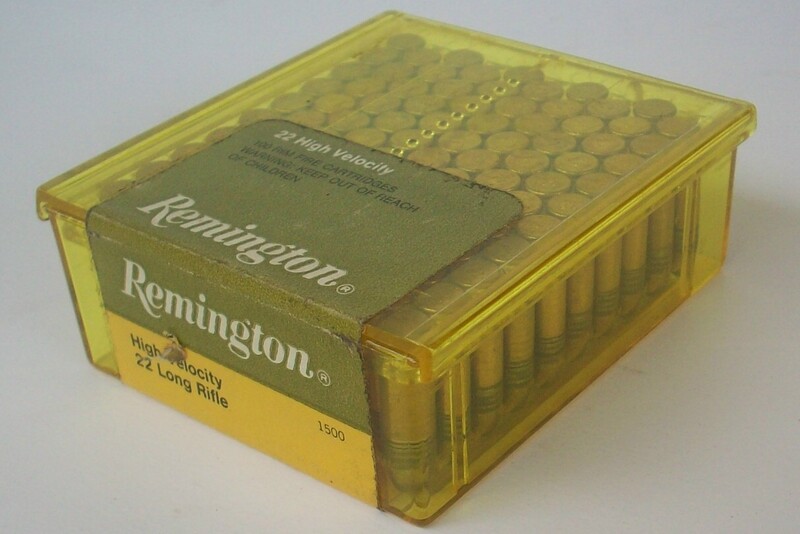 This Remington manufactured green and yellow cardboard box contains all 50 rounds of 33 grain Trunca.. This Sears manufactured red, white, and black cardboard box with sunburst style logo contains all 50.. This Smith & Wesson blue and white cardboardbox contains 45 of the original 50 rounds of 158 gra.. This Winchester Cartridge Company (Olin Corporation) plain tan cardboard box with black printing con.. This Winchester-Western manufactured yellow, red and blue cardboard box with circular bullseye targe.. This Winchester-Western manufactured white, yellow, blue, and red cardboard box with the circular bu.. This Winchester-Western Division manufactured yellow, red and blue cardboard box contains all 50 rou.. This Western Super-X manufactured yellow, blue, and red cardboard box contains all 50 rounds of holl.. This Winchester-Western Division manufactured yellow, blue and red cardboard box contains all 50 rou.. This Winchester-Western Division manufactured plastic sleeve contains all 100 rounds of Super-X extr.. This Winchester-Western manufactured white, blue, and red cardboard box contains all 50 rounds of st.. 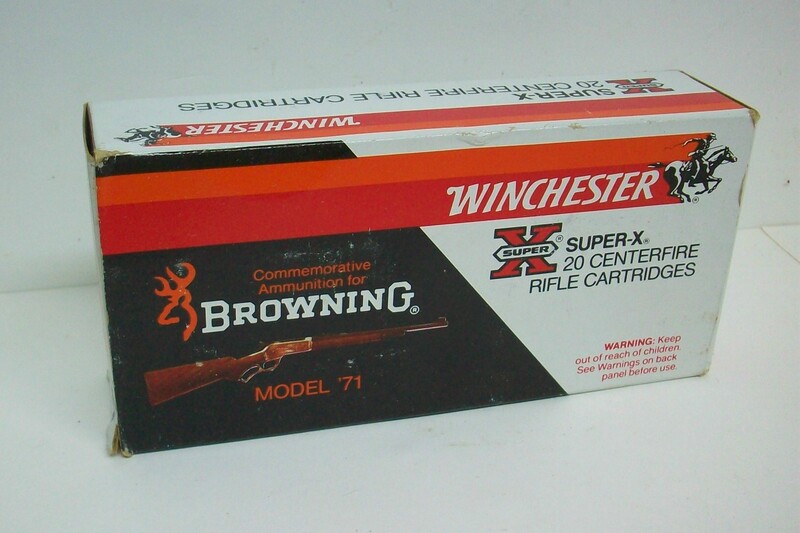 This Winchester-Western manufactured cardboard box contains all 50 Super-X 22 Magnum Action Proving .. 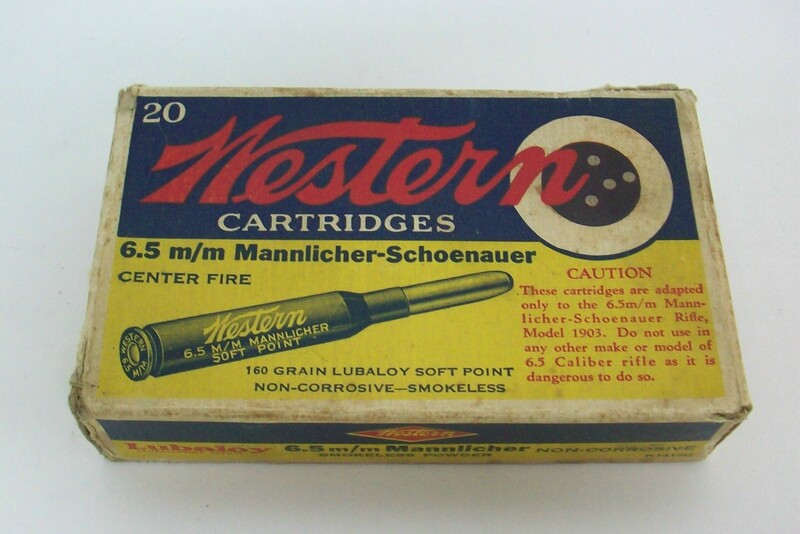 This Winchester-Western manufactured cardboard box contains all 50 Short Action Proving Dummy Cartri.. This Winchester full top two piece cardboard box with wrap around orange and green label contains 46.. 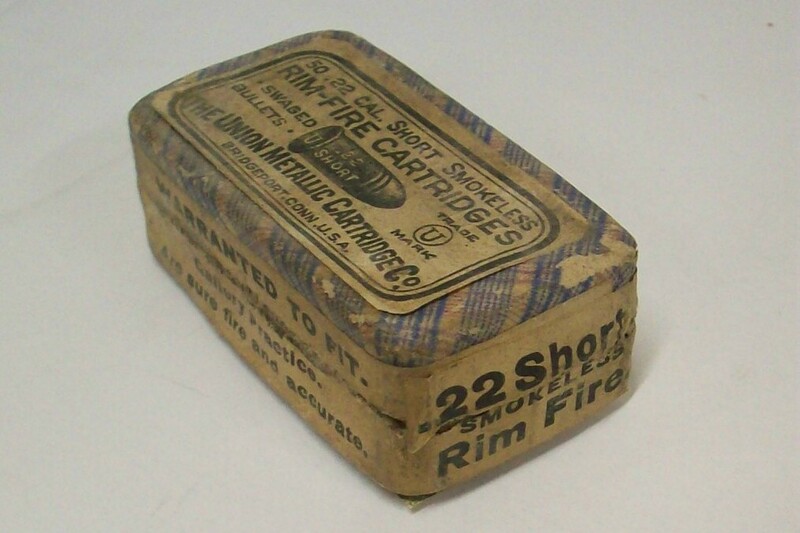 This Winchester manufactured yellow, red and blue cardboard box contains all 50 extra loud 22 Short .. 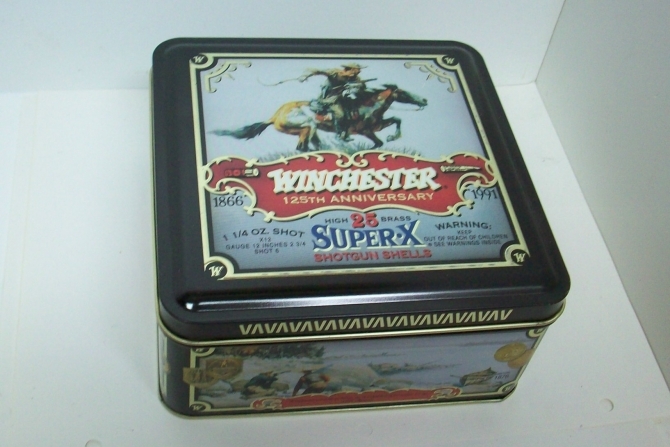 Original 1991 manufactured tin of Winchester 125th Anniversary 12 Gauge 2 3/4" No. 6 shot shotgun sh.. This Winchester manufactured yellow, blue and red cardboard box contains all 50 rounds of Improved L.. This Winchester manufactured yellow, blue and red cardboard box contains all 50 rounds of Leader Sta.. 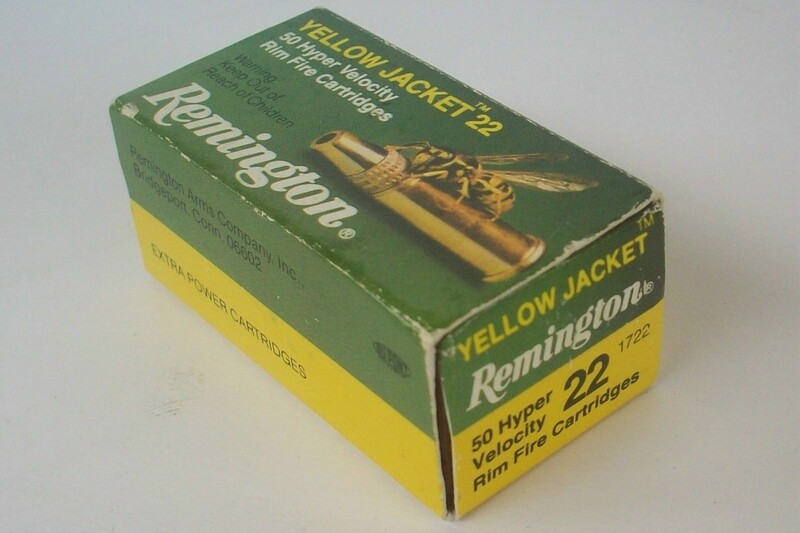 This Winchester manufactured yellow and blue cardboard box contains 42 of the original 50 rounds of .. 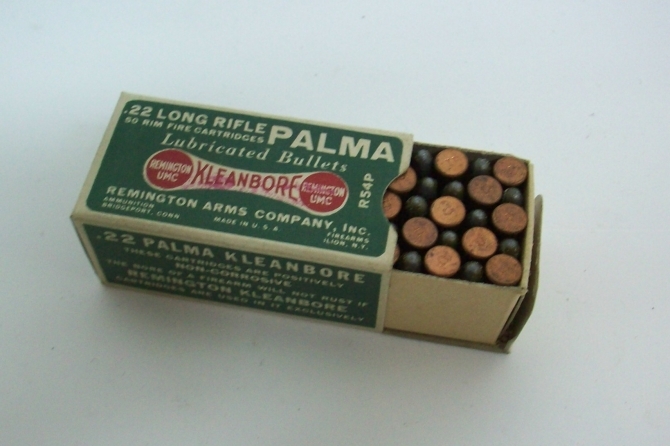 This Winchester manufactured white cardboard box contains all 50 rounds of Ball 22 LR ammunition and.. 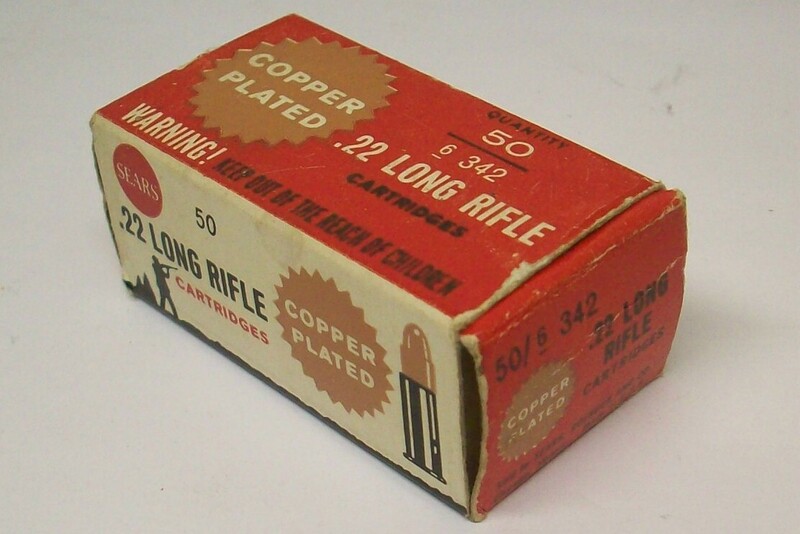 This Winchester manufactured red, green and brown cardboard box contains all 50 rounds of Smokeless .. This Winchester manufactured yellow, blue and red cardboard box contains all 50 rounds of staynless .. This Winchester blue, red and white shield style cardboard box contains all 50 rounds of Kopper Klad.. This Winchester manufactured black, red, and blue cardboard box contains all 50 rounds of 42 grain S.. 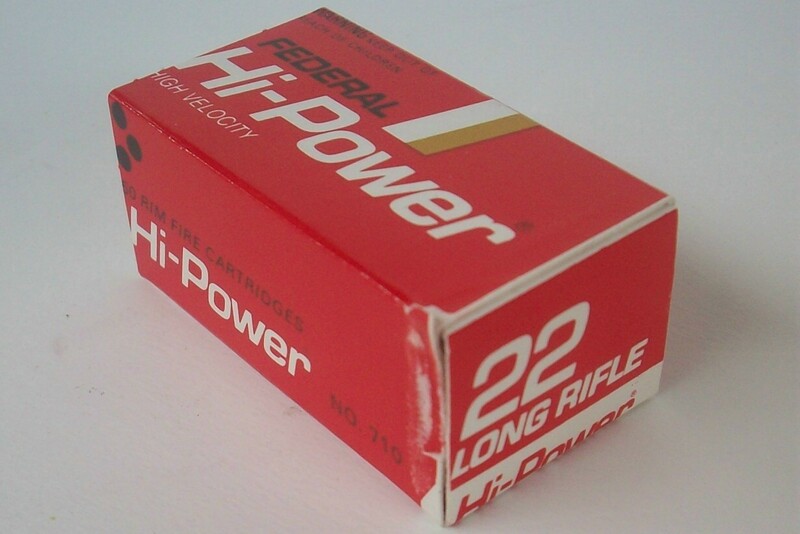 This Winchester manufactured red and yellow box contains all 50 rounds of Super Speed hollow point 2.. This Winchester red and yellow Super Speed box contains all 50 rounds of hollow point 22LR ammunitio.. 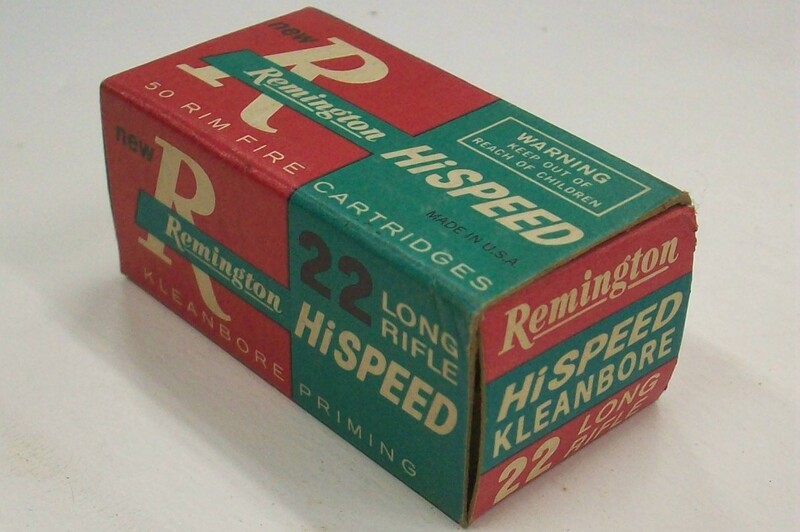 This Winchester manufactured red and yellow cardboard box contains all 50 rounds of Super Speed long.. 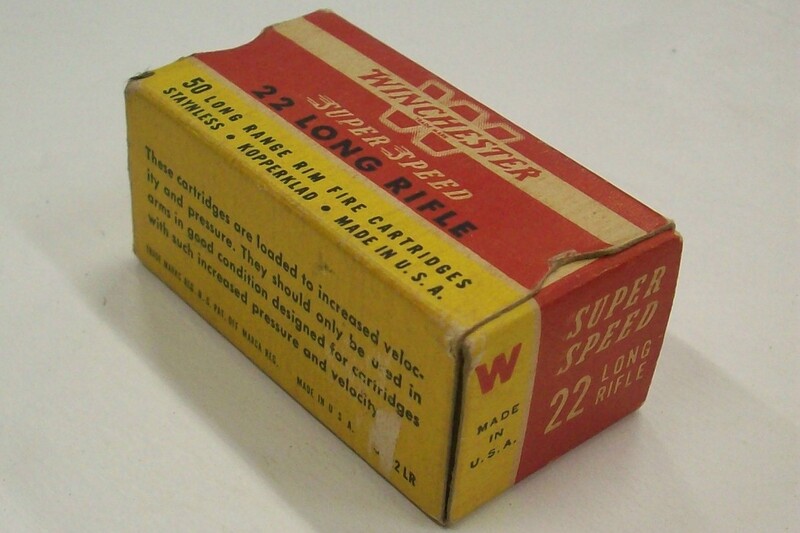 This Winchester manufactured red and yellow cardboard box contains all 50 rounds of Super Speed 22 L.. This Winchester manufactured yellow, blue and red cardboard box contains all 50 rounds of Super Spee.. This Winchester manufactured silver and red cardboard box contains all 50 rounds of 40 grain High Ve.. 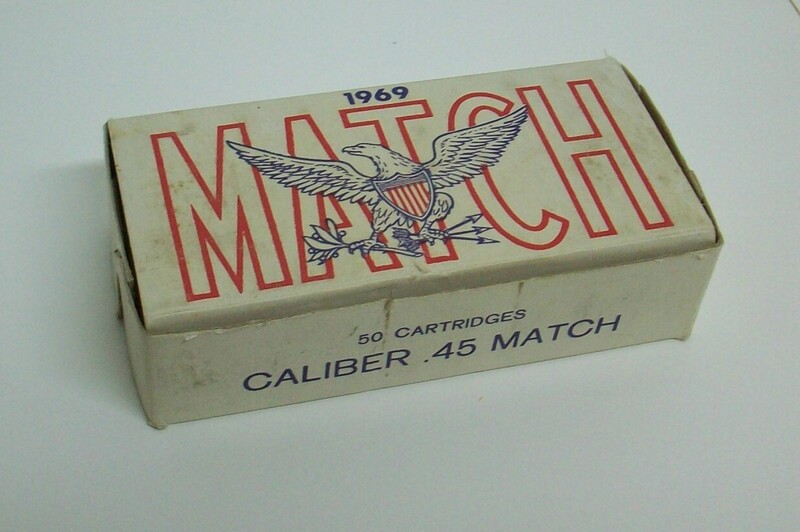 This Winchester manufactured white, blue and yellow cardboard box contains all 50 rounds of 40 grain.. 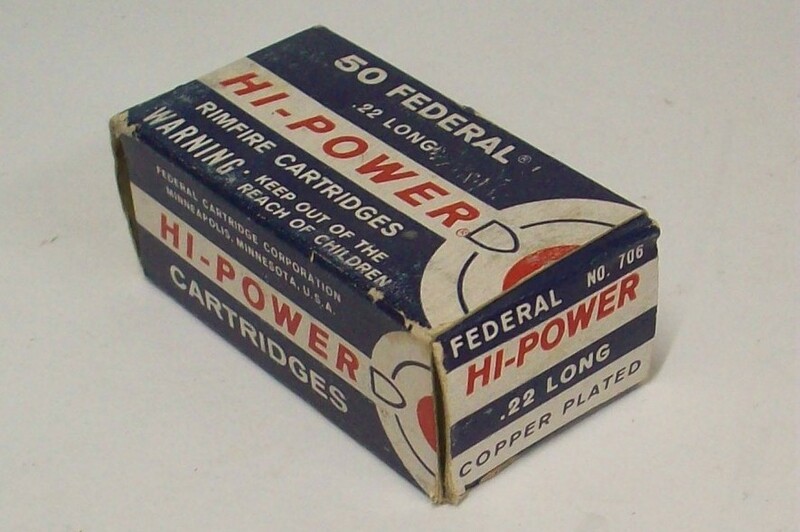 This Winchester manufactured white, red, and orange cardboard box contains all 50 rounds of 40 grain.. 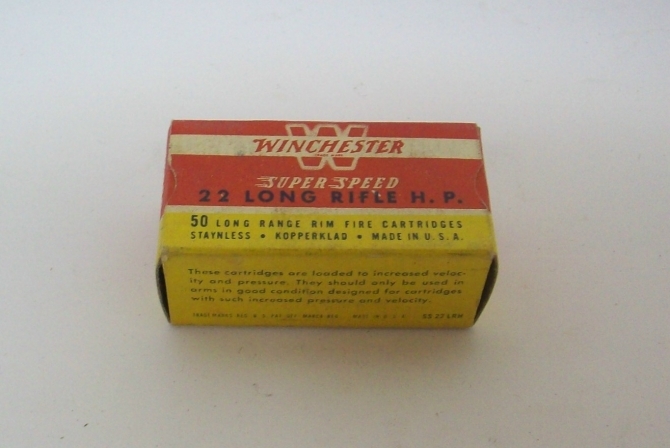 This Winchester manufactured silver and red cardboard box contains all 50 rounds of 36 grain Super-X.. 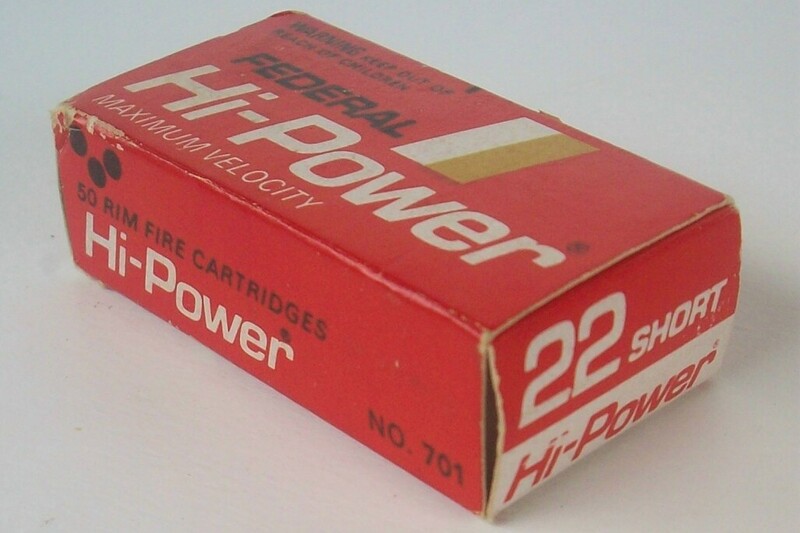 This Winchester manufactured silver and red cardboard box contains 44 of the original 50 rounds of 4.. This Winchester manufactured plastic sleeve contains all 100 rounds of 40 grain Super-X extra power .. 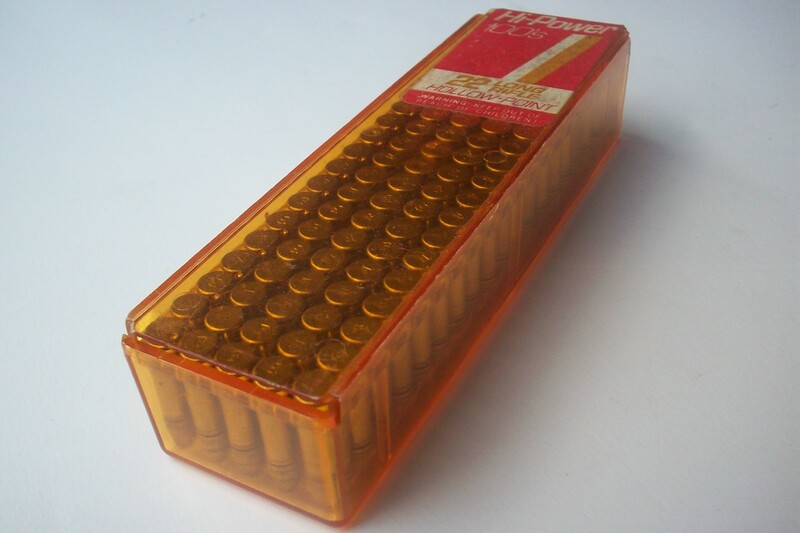 This Winchester manufactured factory sealed plastic sleeve contains all 100 rounds of 40 grain power.. This red, white, and blue Winchester Western Super Match cardboard box contains all 50 rounds of 148.. This Winchester-Western manufactured white, blue, and red cardboard box contains all 50 rounds of hi.. 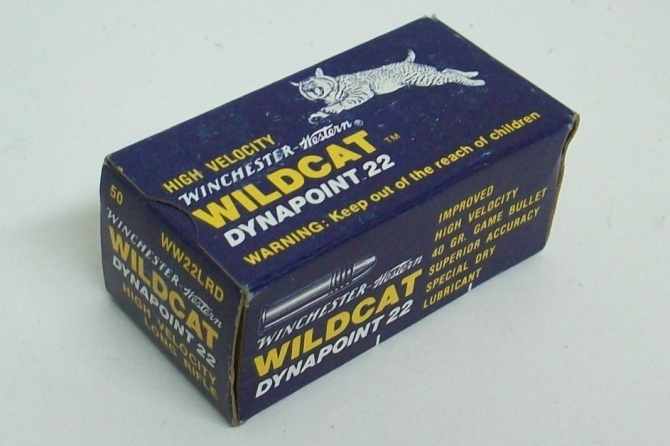 This Winchester manufactured box of Wildcat high velocity 22LR ammunition is in near excellent condi.. 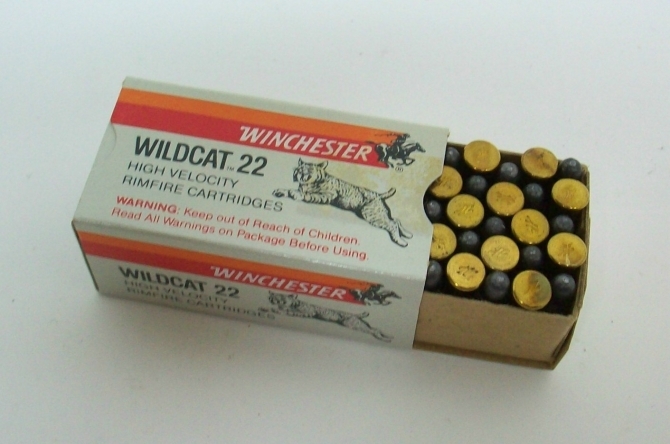 This Winchester-Western blue, white, and yellow cardboard box contains all 50 rounds of high velocit..